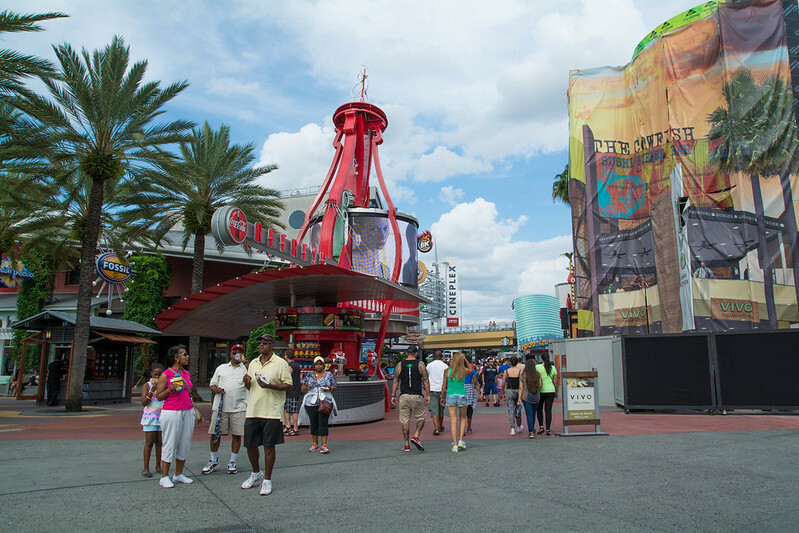 When purchasing our day pass to Islands of Adventure, I looked into the option of adding the Express Pass to our ticket. Universal's Express is similar to Disney's FastPass+ in that it allows you to enter a different, shorter line for most attractions. However, rather than having specific return times, Express allows you to enter the queue at anytime. 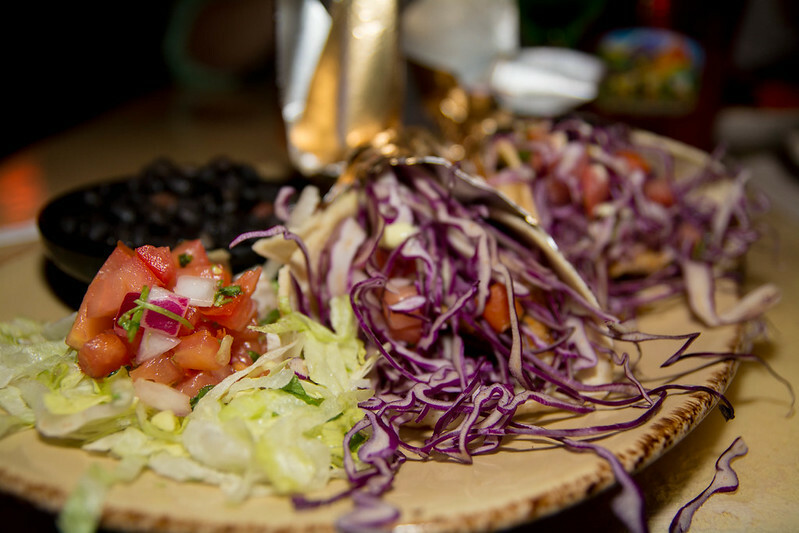 Express is complimentary for guests staying at Universal's three deluxe resorts (Portofino Bay, Hard Rock, and Royal Pacifica). 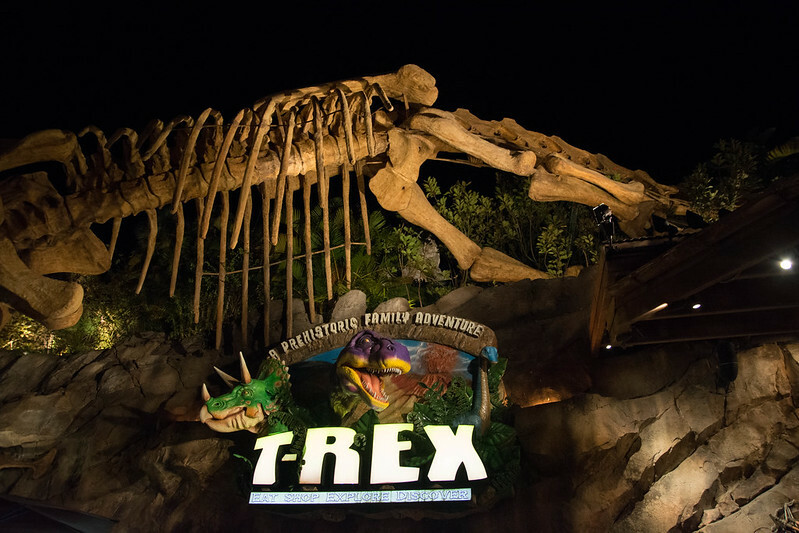 However, for all other guests, Express is available at an additional cost, depending on the time of your visit and how many rides you purchase. For the Sunday we were visiting, an Express Pass redeemable for three rides was $60 per person, and it only went up from there. Perhaps it's because I'm used to Disney's FastPass+ which allows all guests at least three FastPasses per day included in regular park admission that I thought $60 for three Express Passes was a little steep. The reasoning behind the price makes sense, though. 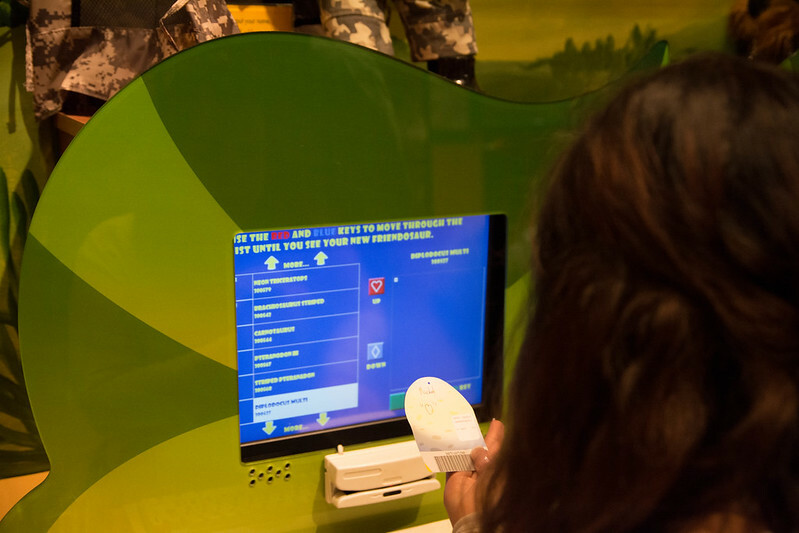 Disney's system allows guests to reserve a specific time to ride an attraction... all guests are limited to a one hour window (plus a 5 minute early, 15 minute late cushion) during which they can ride the select attraction. 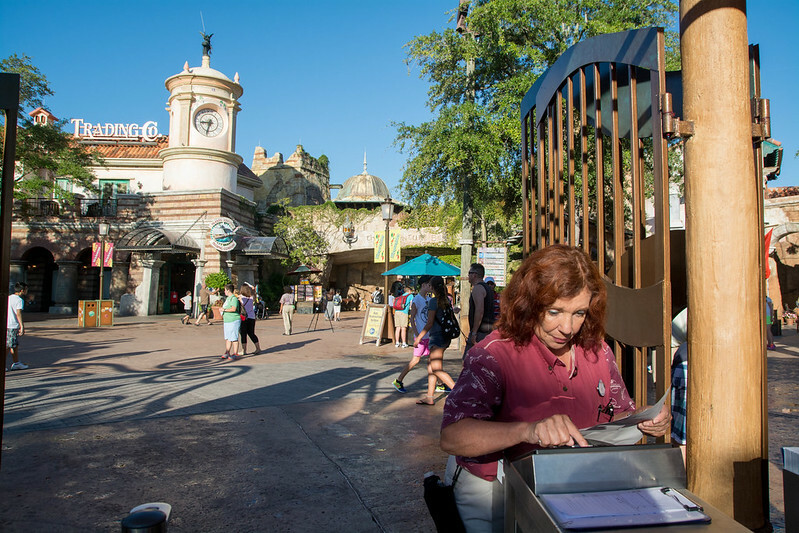 The FastPass+ system also allows only a certain number of FP+ reservations in an hour per attraction, so there is a limited number of FastPass+ that can be distributed per day. 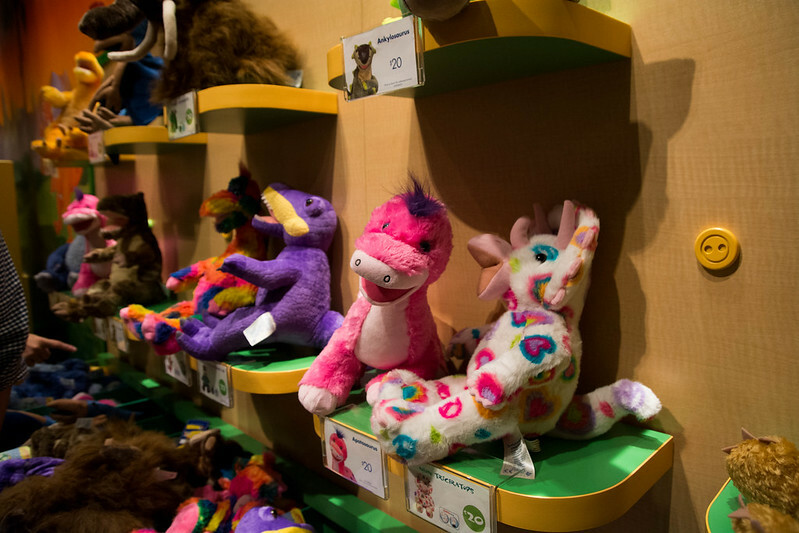 Rather than limiting the number of Express Passes distributed per attraction, Universal limits the number sold with its pricing. If the Express Pass was priced too low, then more guests would buy it, the Express line would be longer, and the Express Pass would no longer be of value. A piece of advice I read in the 2014 Edition of Unofficial Guide to Walt Disney World was to not purchase Express in advance, but wait until the day of. Depending on the crowds that day, we may or may not want to purchase the Express Pass. 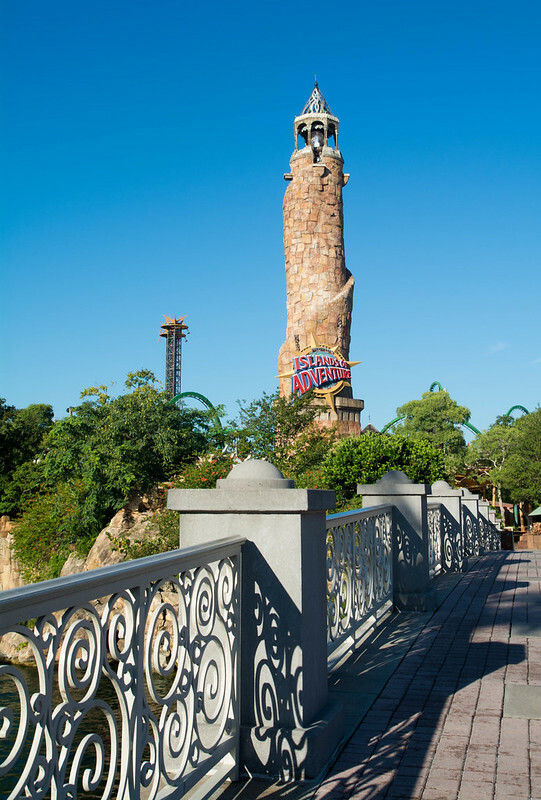 Our plan was to get to Islands of Adventure before park opening that morning so that we would be able to ride all of the biggest attractions without a very long wait. Turnstiles - how antiquated! We had printed our tickets out at home, and my ticket was not scanning. The Team Member had to type in the number to allow me into the park. They let us in the turnstiles before park opening (having to type in codes, can you imagine how backed up they would be if they didn't?) and had ropes set up outside Suess Landing and Marvel Super Hero Island. The Suess Landing rope was more popular... because those guests were most likely headed to the Wizarding World of Harry Potter. 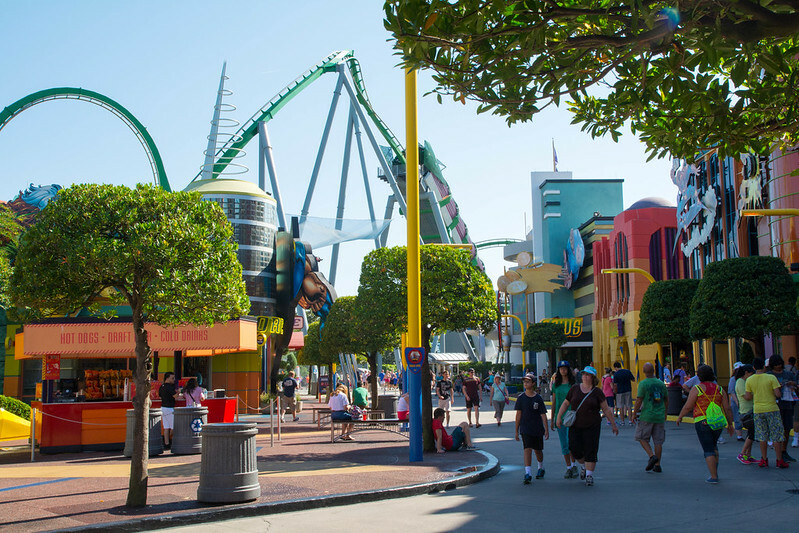 We decided to wait outside Marvel Superhero Island, though, because the one-day Islands of Adventure Touring Plan in my 2014 Unofficial Guide to Walt Disney World suggested riding the Incredible Hulk first. 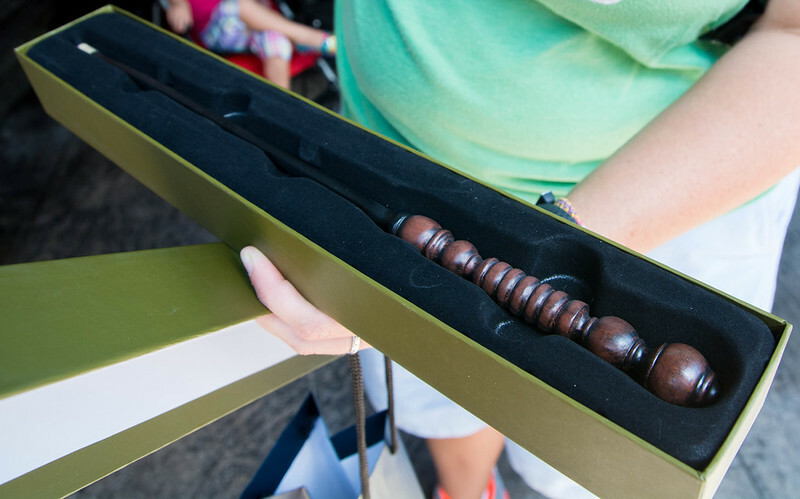 Rather than walking the rope like Disney will do to popular attractions, Universal just dropped the rope and let the madness begin. People were in a mad rush, and some were sprinting. We had to rent lockers before we were able to get in line, but it wasn't too much of a hold-up. We were able to wait for the front row on the Hulk, and it only took about 15 minutes. 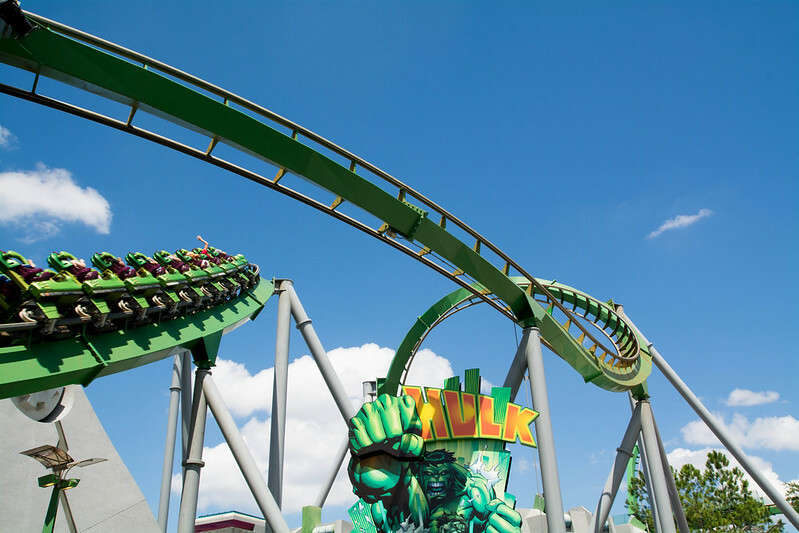 The Incredible Hulk is a great roller coaster. 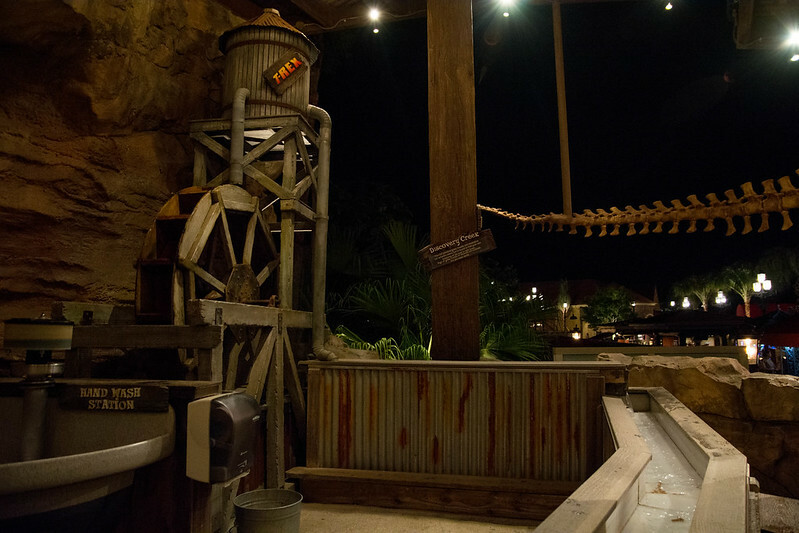 The theming is minimal and the story weak, but the coaster itself is very well done. 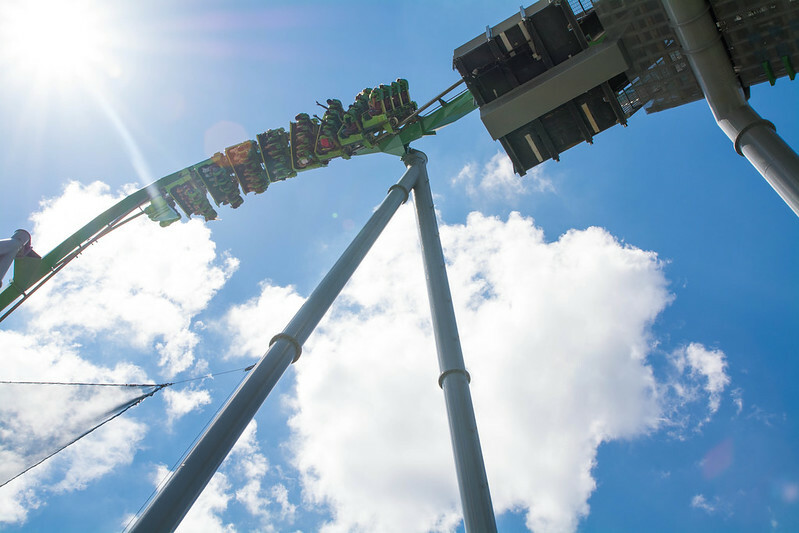 It starts off with a 9 to 40 mph in 2 seconds launch into seven inversions. 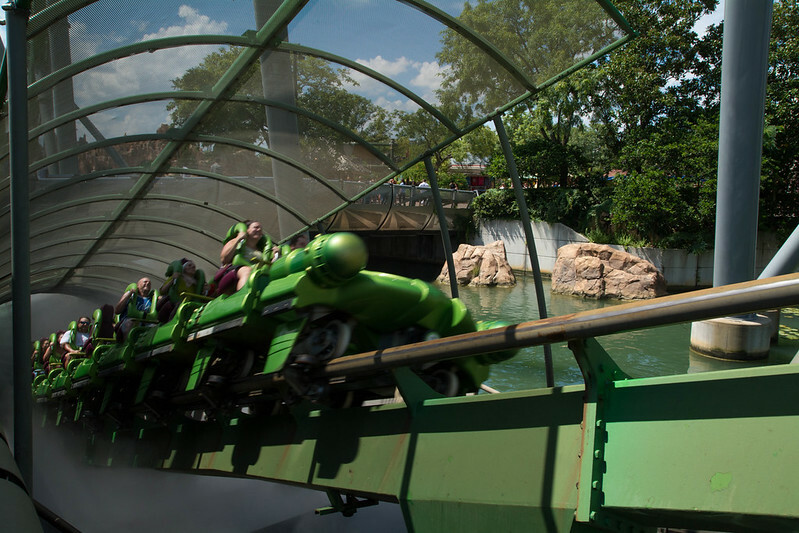 While exhilarating, the ride is very smooth which is why it ranks so highly on my list of attractions. We then headed to the Amazing Adventures of Spiderman. I remembered this being a great ride, but it's received a few updates since I last rode it in 2007 (refurbished in 2012). Unlike the Incredible Hulk, The Amazing Adventures of Spiderman has a strong narrative which begins in the queue. 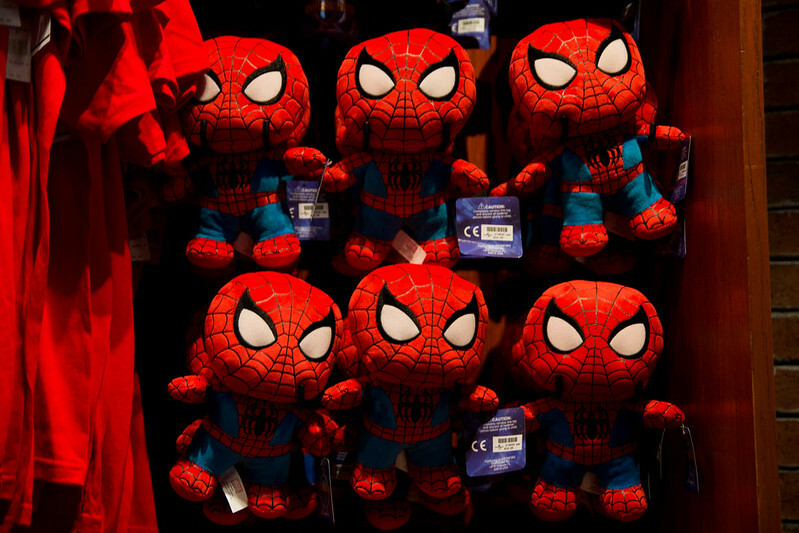 We're working at the Daily Bugle, and are sent to follow Spiderman to get a great story. We board the "Scoop" vehicle and head out in New York City to follow Spiderman. 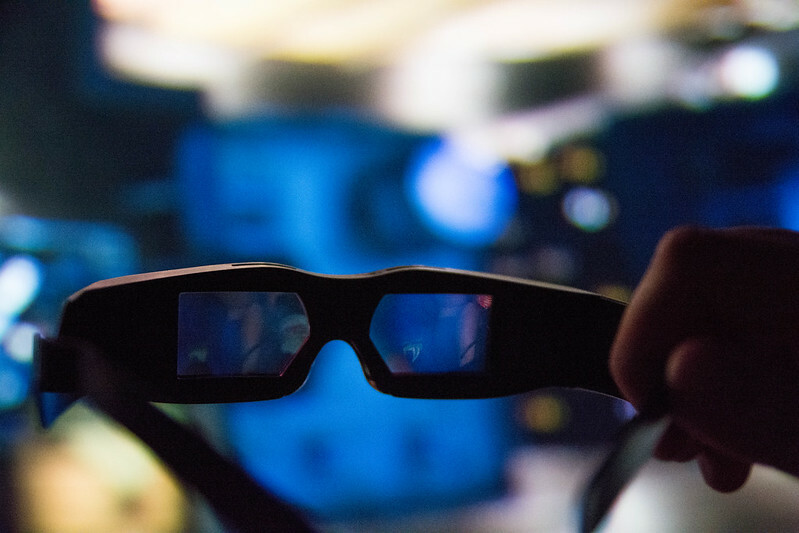 The technology on this 3D thrill ride is exceptional. The animated characters feel convincingly real, as does the simulated freefall. 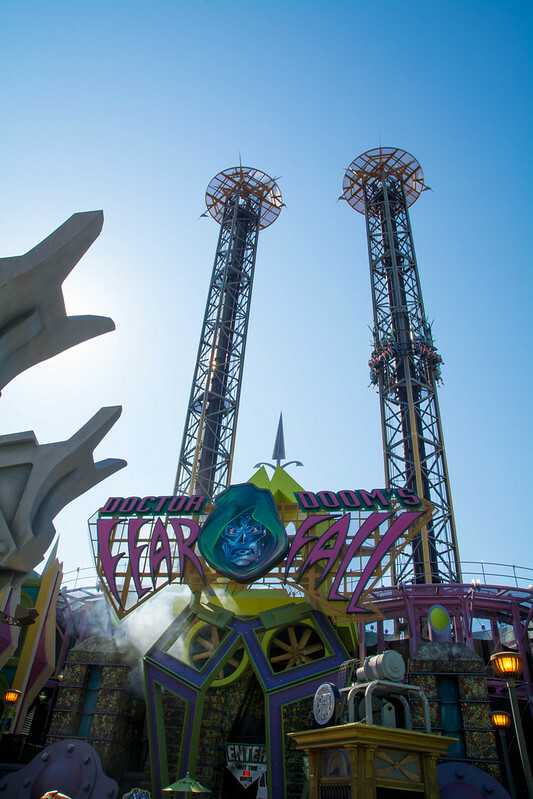 Continuing our tour through Marvel Superhero Island, the next stop was Doctor Doom's Fear Fall. The wait was listed at 5 minutes, but it was more like 15. The queue is loud and not very entertaining. As for the fear fall, the actual blast is pretty thrilling, but after the initial shot into the air, you're just bouncing up and down all the way back to the start... not much of a fear fall. 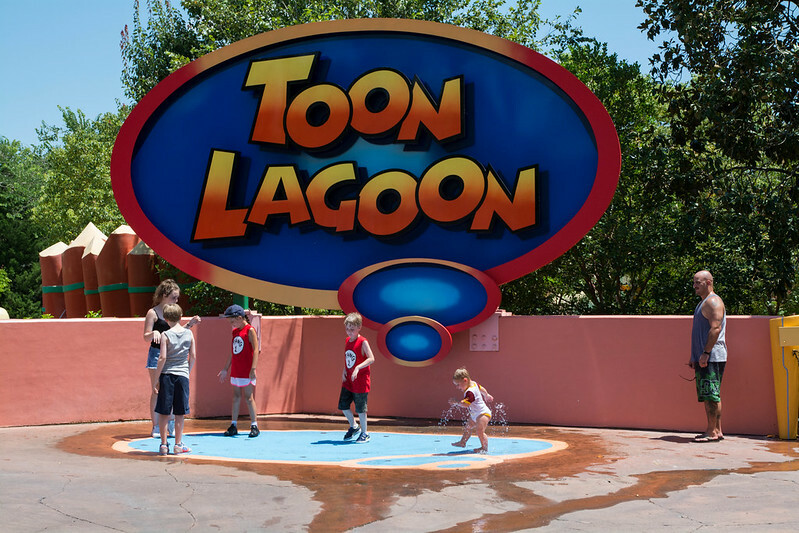 Going clockwise, we left Marvel Superhero Island and walked through Toon Lagoon. I say "walked through" because that's exactly what we did. We had no desire to ride the water rides and walk around the rest of the day in soaking wet clothing. The theming in this area is pretty cute, though. I was wondering why Max wouldn't follow me over to the dialogue bubble for my photo.... the perspective would have been much better had I stood about 10 feet in front of it. 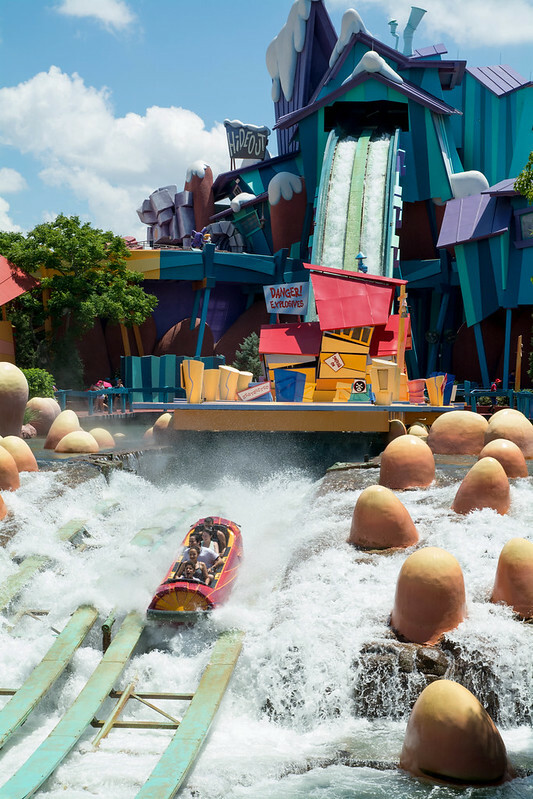 While we didn't want to try out any of the water rides in Toon Lagoon, we did decide to take the Jurassic Park River Adventure. 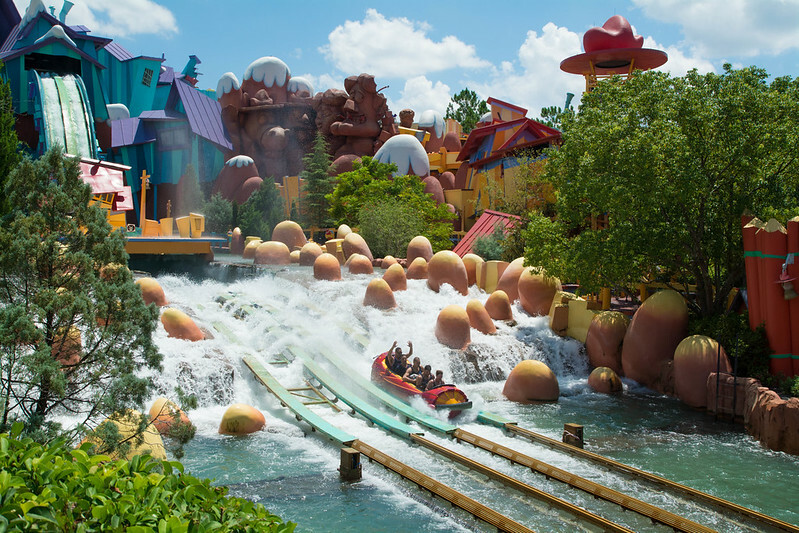 I've learned from all of my research of Splash Mountain that on flume rides like this, the actual drop doesn't create a splash, and you only get wet from the water jets that are synchronized to blast you when you reach the bottom. So I always just duck and cover at the last possible moment. I have no photos of the ride because photos are not allowed. 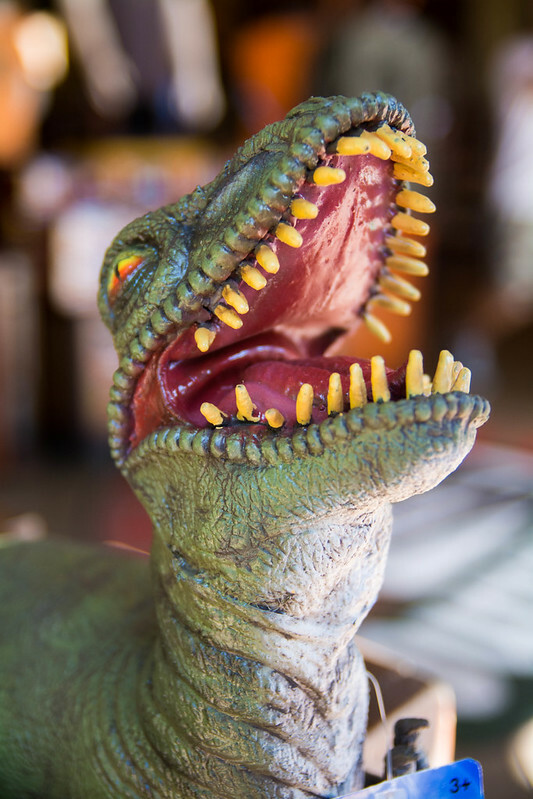 And they reminded us of this when we had reached the scariest part of the ride with the giant dinosaur that's going to eat us. A team member got on the loud speaker and announced, "Absolutely no photos! Row 4, that's no photos!" I was so annoyed. Nothing takes away from an attraction more than an announcement over the loudspeaker. And at the climax of the ride! The girls in front of us were not bothering me, but the obnoxious team member took away from my experience! 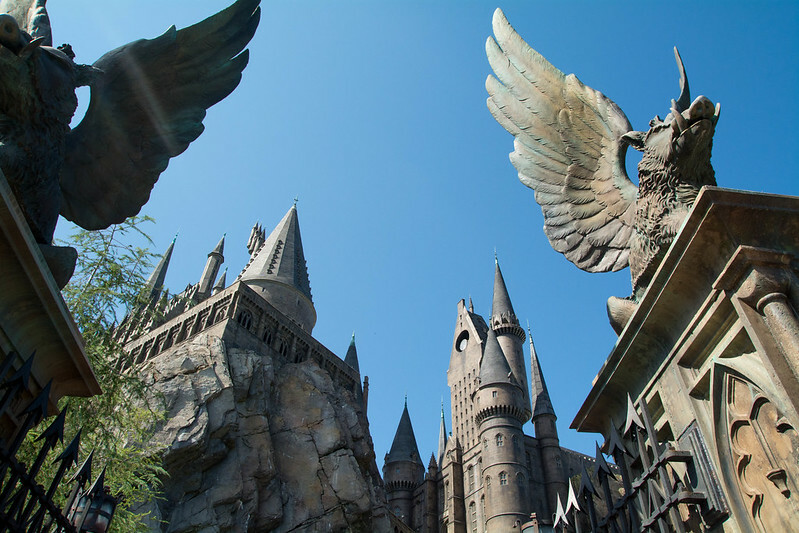 It was time to enter the Wizarding World of Harry Potter. While I appreciated the detail of the snow-topped buildings and evergreen trees, the incredibly hot weather really contradicted that ambiance for me. I noticed a show starting on the stage and was quick to rush over. 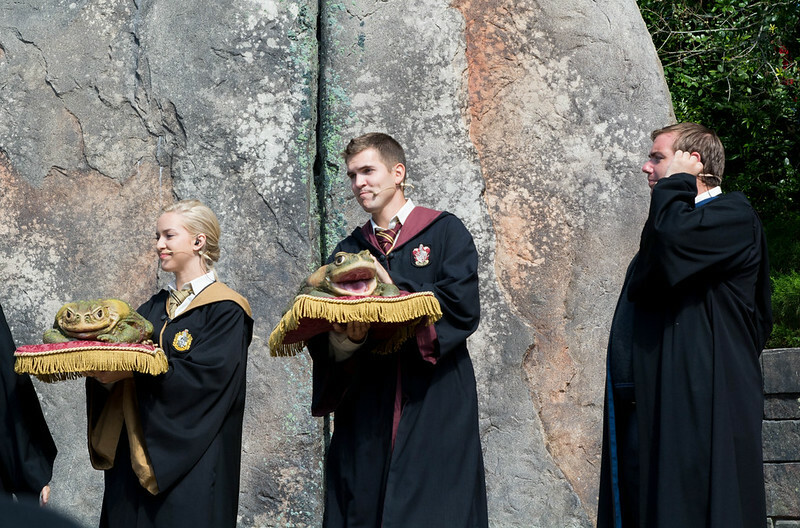 It was Dumbledore's Frog Choir. The a cappella group was good, but not very entertaining. It didn't grab our attention enough to keep us standing out in the sun, and after two songs, we left. 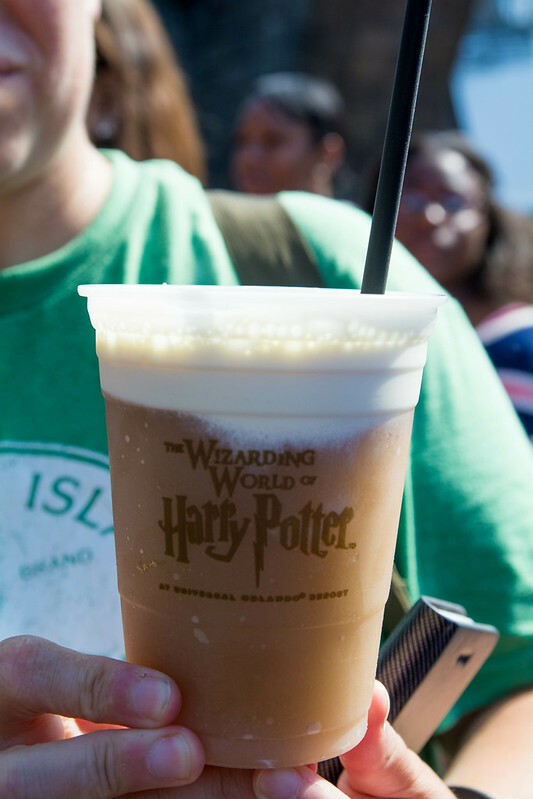 Natalie and Rachel tried the Butterbeer, the non-alcoholic sugary brew concocted exclusively for the Wizarding World. 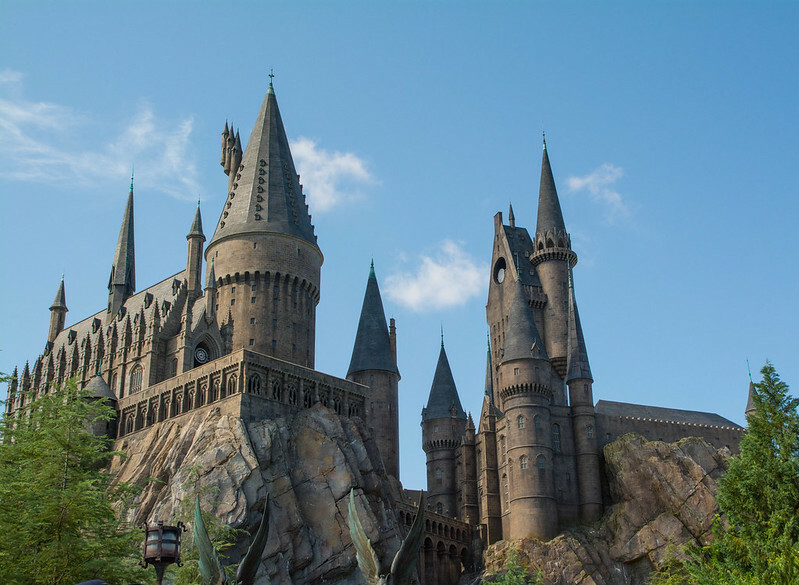 Inside the Hogwarts Castle is Harry Potter and the Forbidden Journey, an exceptional thrill simulator ride like no other. 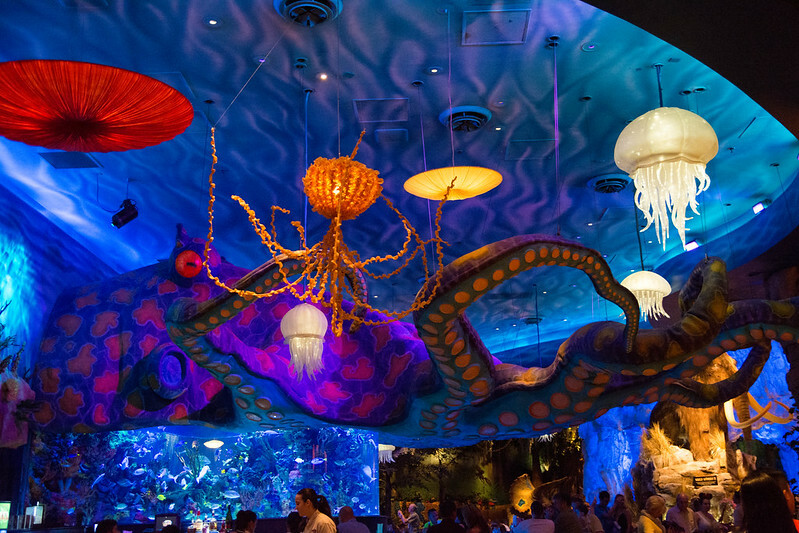 Think Soarin' meets Mission:Space. This attraction gets an A+ in my most important area of criteria for a great theme park attraction - story and overall theme. 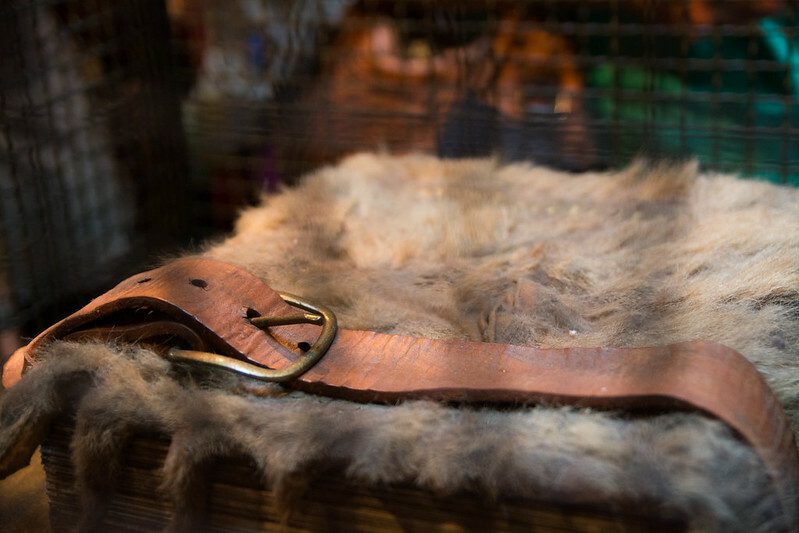 The story begins in the ride queue, which is really entertaining enough in itself, so if you cannot ride - whether due to the limiting seat constraints, health issues, fear of flying, or prone to motion sickness - I would encourage that you walk through the queue and take the "chicken door" right before the boarding area. 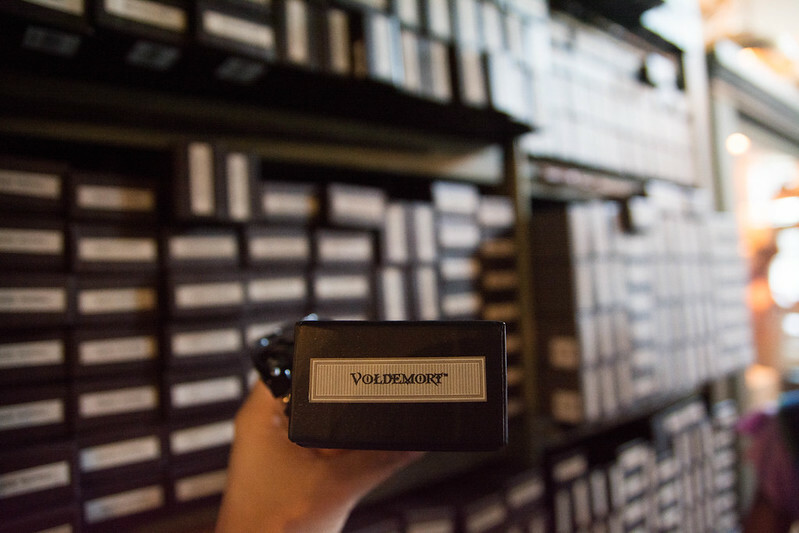 You weave through the Hogwarts Castle and enter a room with the talking portraits who are carrying on a conversation and then enter a room with Harry, Ron, and Hermione (rather realistic projections) and meet Dumbledore. The ride technology is really great. The vehicle is on a continuously-loading rotational track. 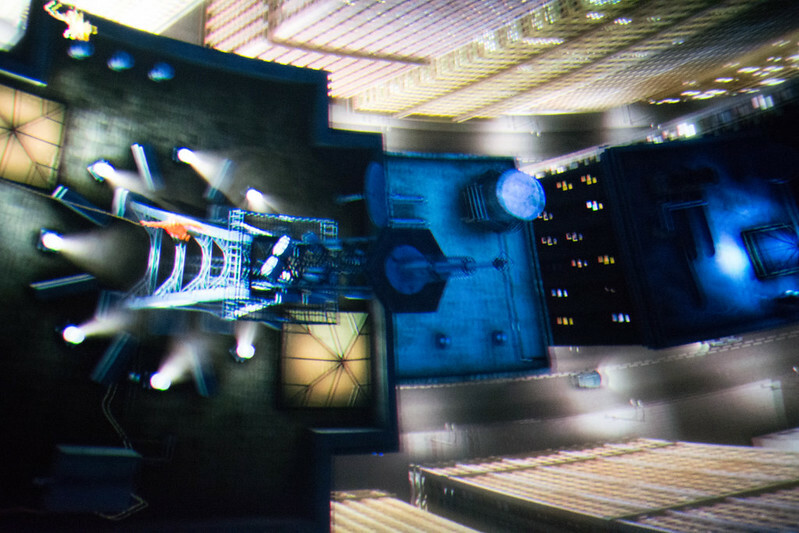 Within the ride, there are scenes that utilize projection, as well as scenes which use dark ride elements. It feels very realistic, and I seriously screamed the first time a Dementor popped up in front of me. 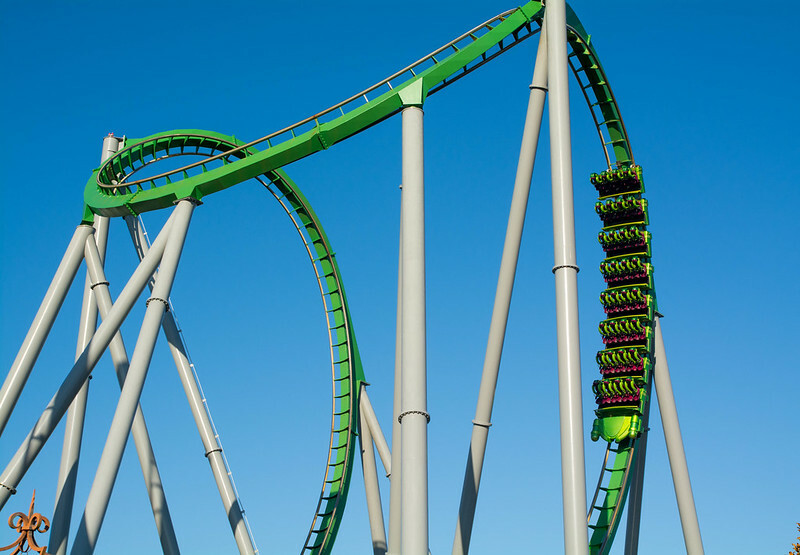 The only issue that I had was that there were a few times which I felt a little bit of motion sickness, and because of that, I didn't really want to ride it, again. 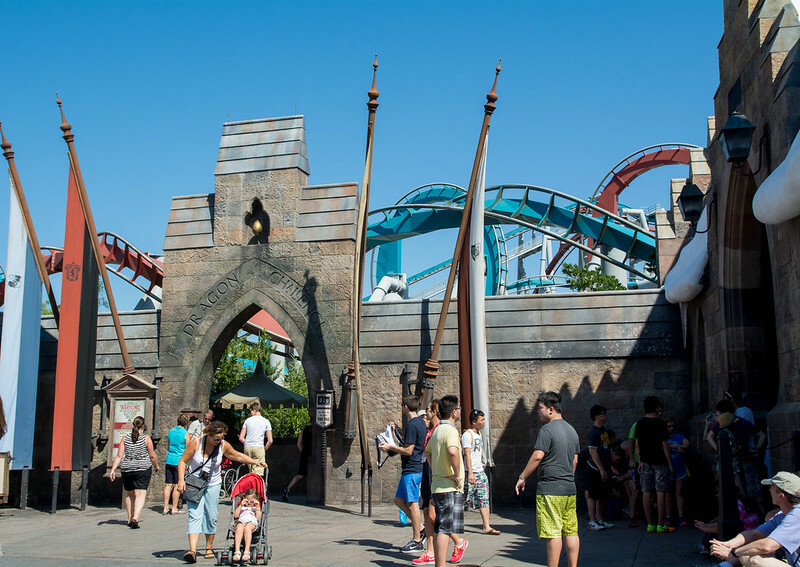 Dragon Challenge is the exact same roller coaster that used to operate as Dueling Dragons in the Lost Continent. The re-theming of this coaster is quite minimal. 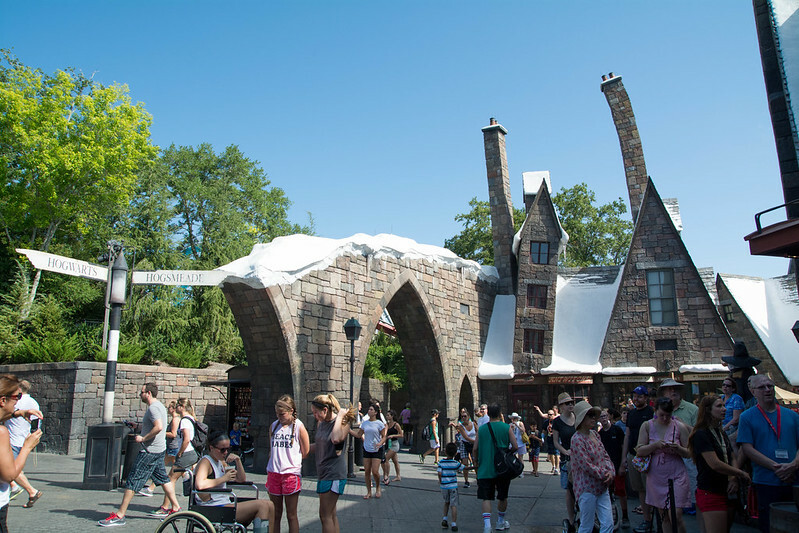 In fact, all they really did was change the entrance to fit the rest of the Wizarding World. Everything else about the original coaster - dragon cars and blue and red tracks - remains the same. 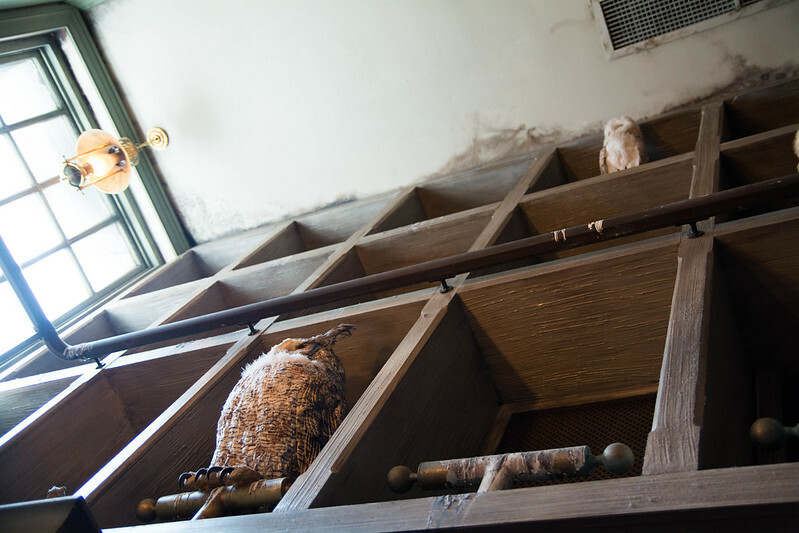 Honestly, I am a little surprised that JK Rowling would allow such haphazard re-theming in her Wizarding World. Another difference is that the red and blue coasters no longer run simultaneously. 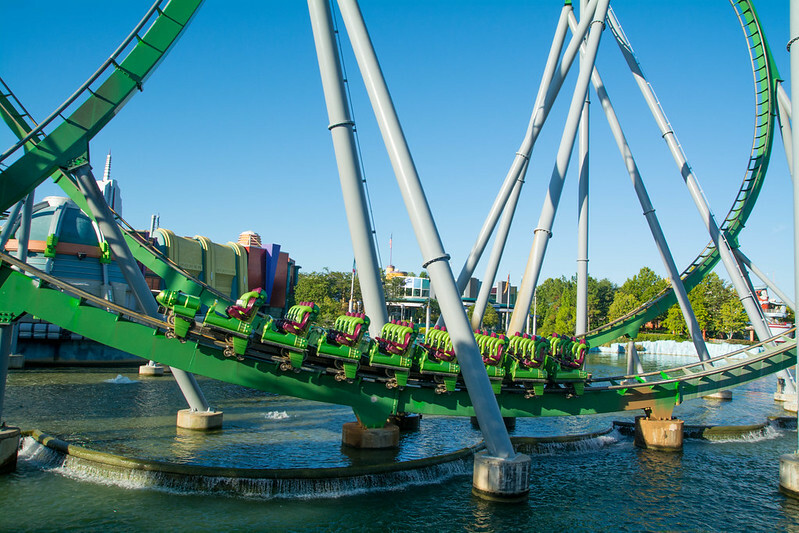 I've read that they had issues with people trying to throw things at the other coaster car, so Islands of Adventure no longer runs them at the same time for safety reasons. The coaster itself is another great thrill. I actually felt more G-force with Dragon Challenge than I did on Incredible Hulk. 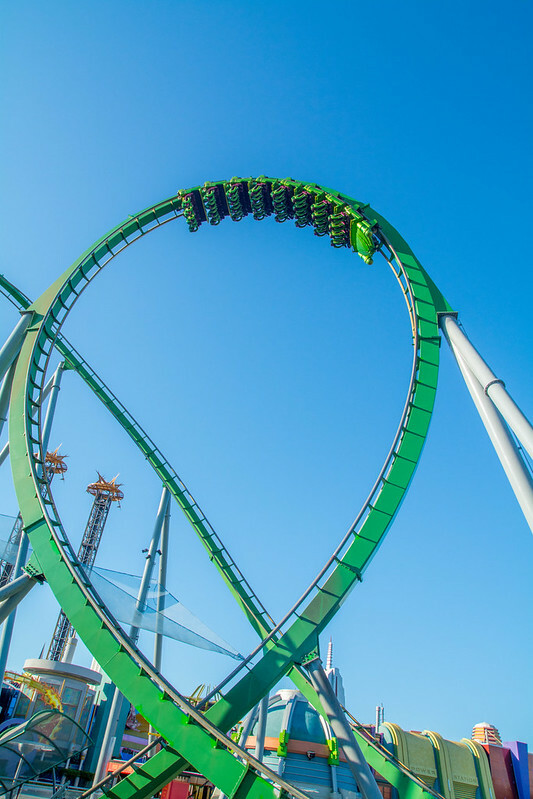 But now that it's missing the coolness factor of the mirroring coaster, I think the Hulk wins in overall attraction because it has slightly better theming, as well as the initial 9 to 40 launch. 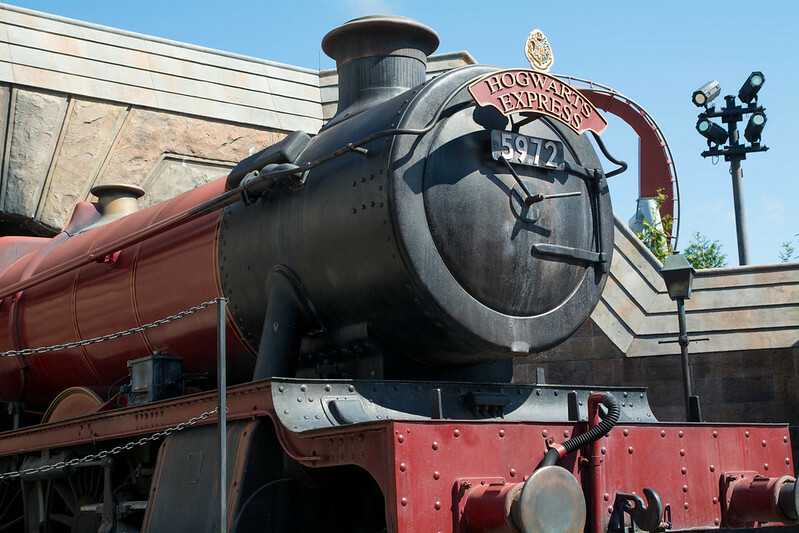 One attraction in the Wizarding World that we could not ride was the Hogwarts Express. 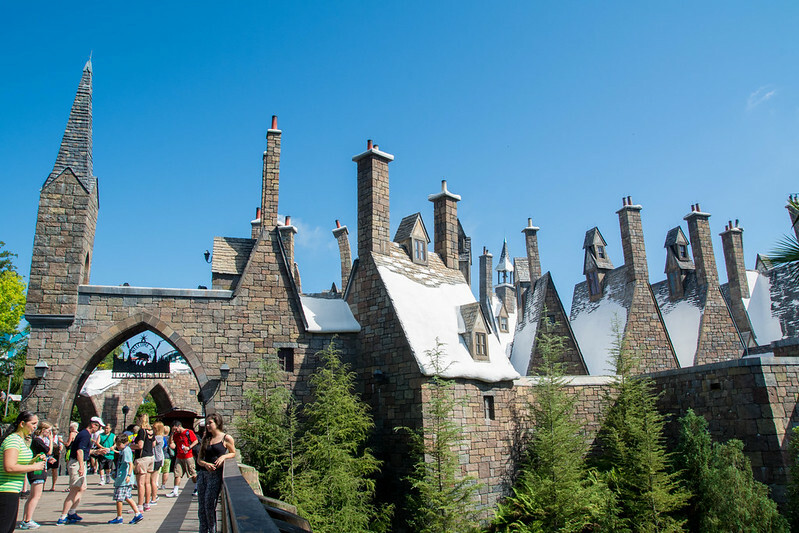 Clever Universal decided to build part of the Harry Potter theme park in Islands of Adventure and the second part in Universal Studios (opened summer 2014). 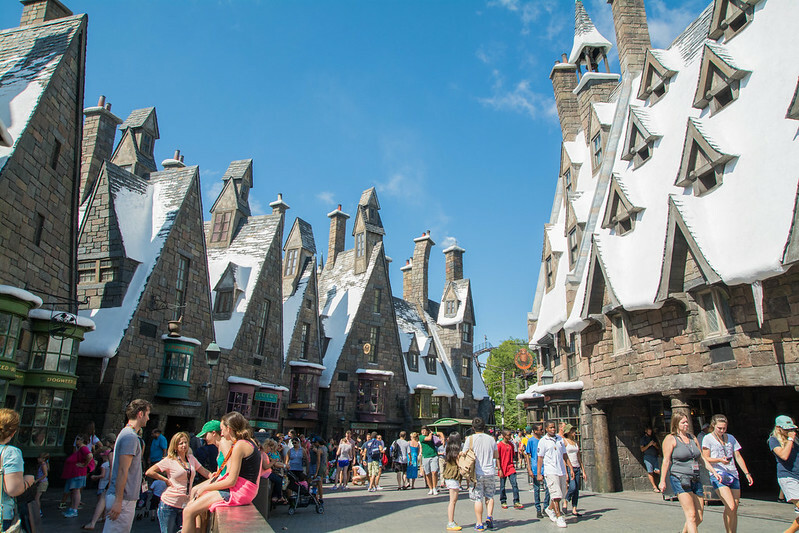 The Hogwarts Express links the Wizarding World of Hogwarts and Hogsmeade in Islands of Adventure to the recently opened Diagon Alley in Universal Studios. 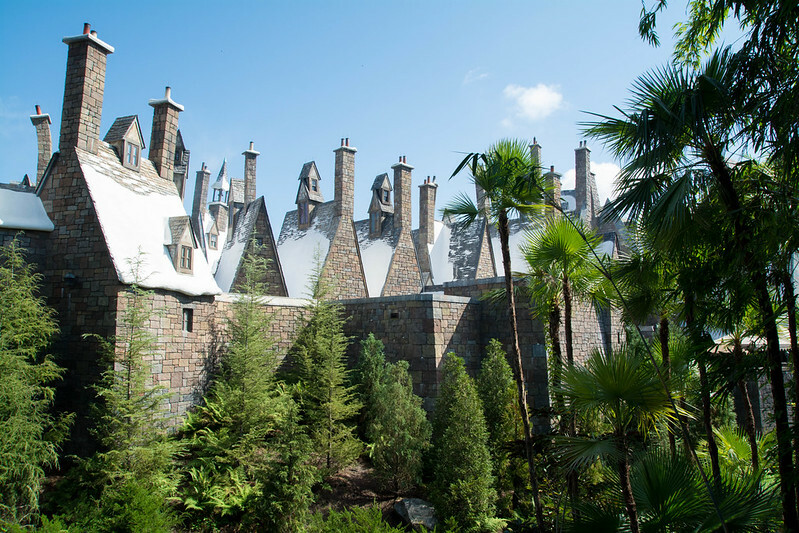 In order to ride the Hogwarts Express, you must purchase the $40 park to park ticket upgrade. 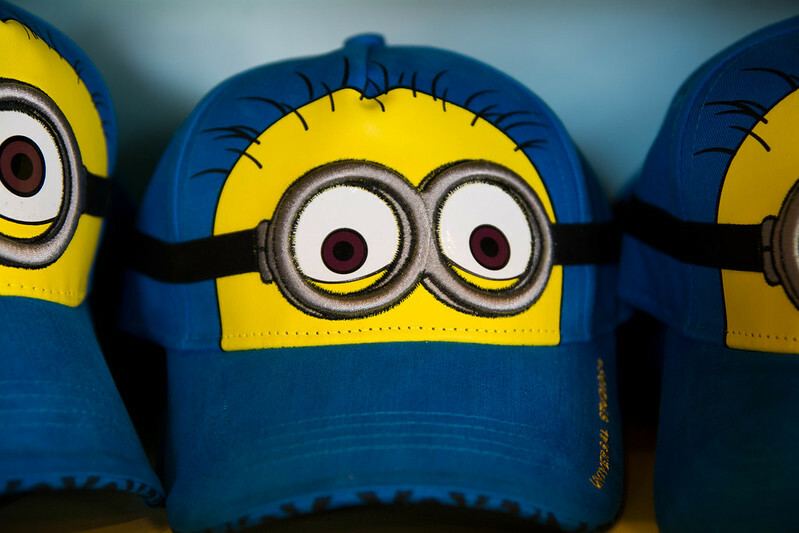 No, thank you.... maybe next time, Universal. 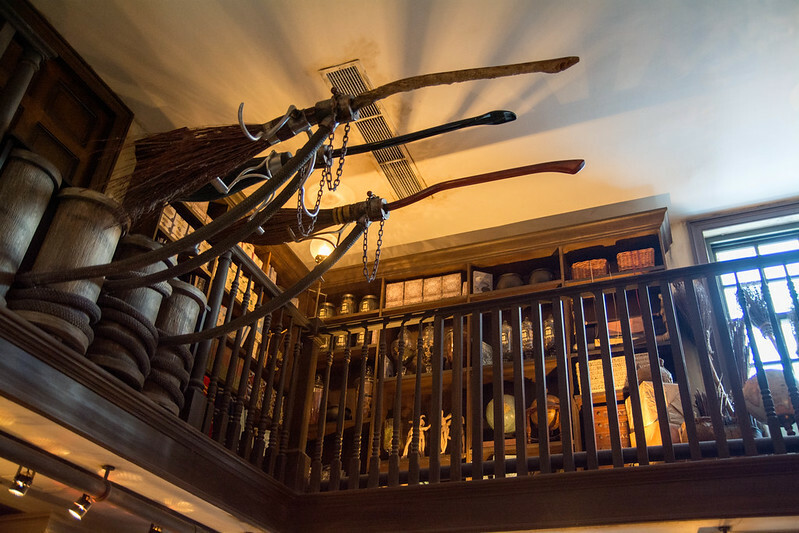 We happened to be in Hogsmeade at lunch time, so we decided to try out Three Broomsticks, the counter-service dining venue in the Wizarding World. 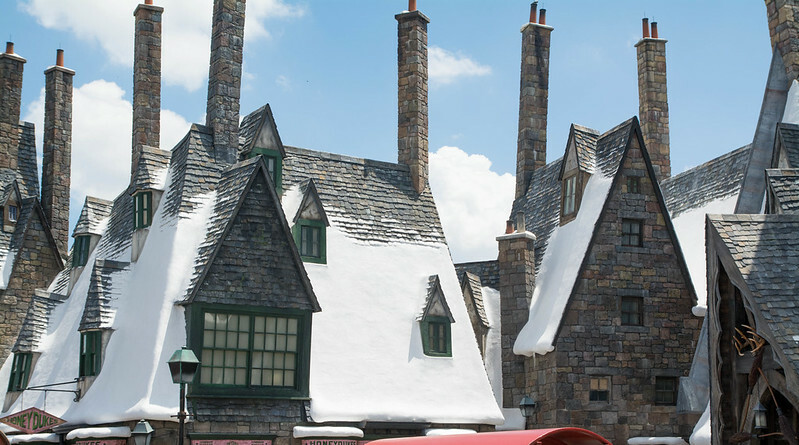 JK Rowling is incredibly detail-oriented and insisted that no Coca Cola products be served anywhere within the Wizarding World, as they do not fit the setting. 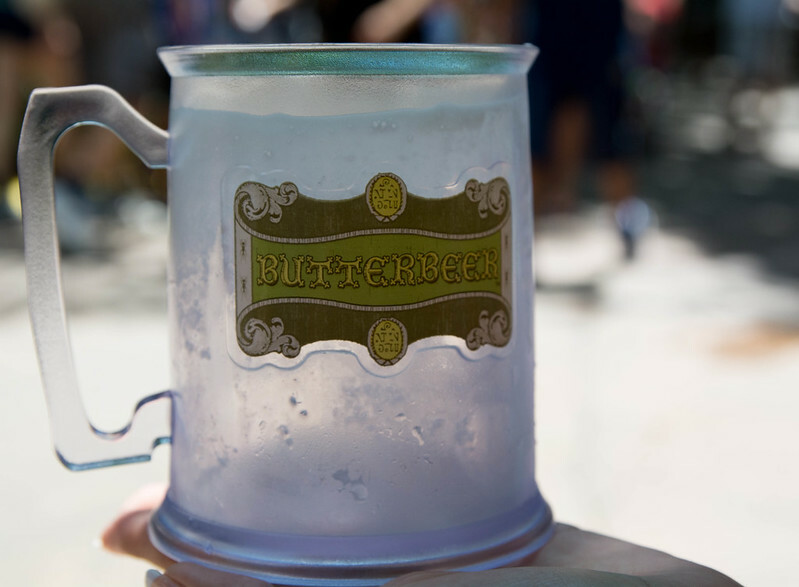 Instead of soda, one can order Butterbeer (non-alcoholic), Pumpkin Juice, Pumpkin Fizz, Cider (non-alcoholic), water, iced tea, lemonade, or one of the two draft beers at the counter - Hog's Head Brew or Domestic (for us, it was Budweiser). 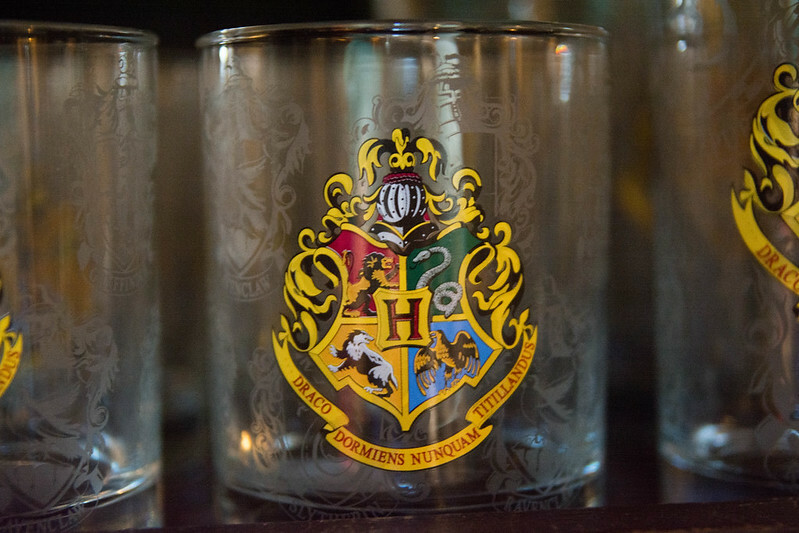 That being said, I was surprised at some other non-themed goods within the Wizarding World like pre-packaged salad dressings of generic brand names. Stop snoozing, Rowling - last time I checked, Harry Potter never squirted dressing on his salad from a little package! 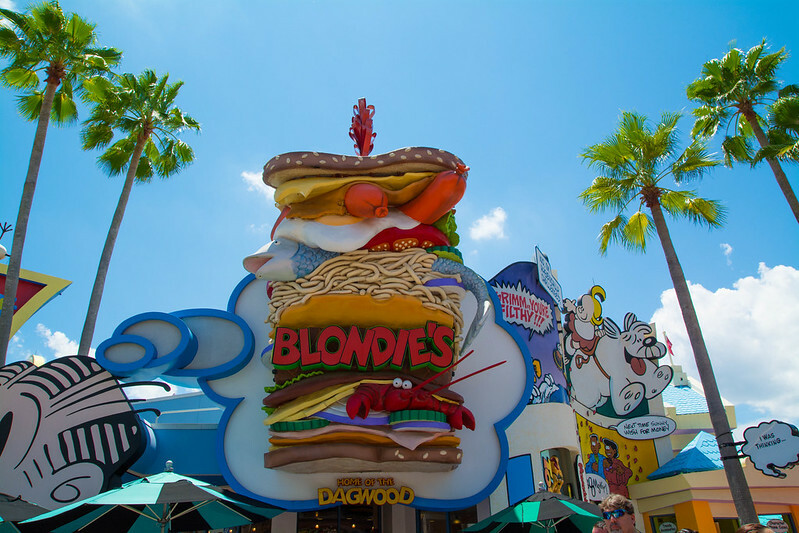 The food here is of course not the typical theme park fare of pizza and hamburgers (Rowling would never allow!) which I found incredibly refreshing. 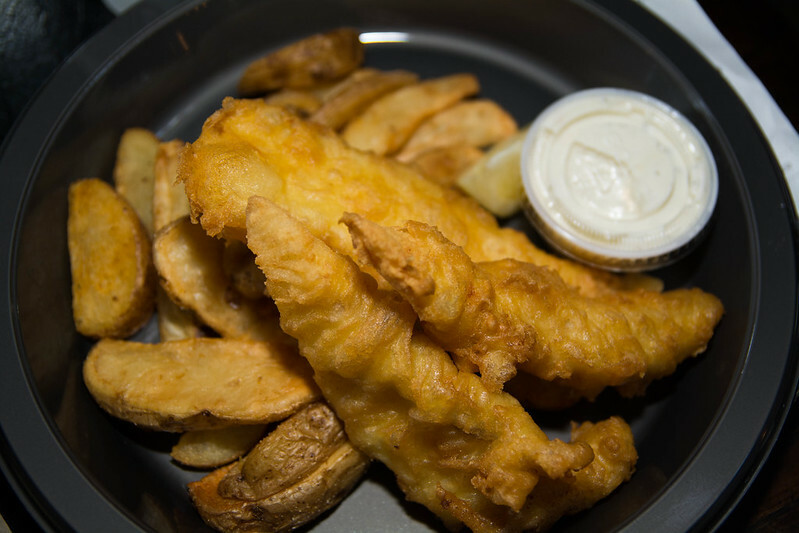 Also, while you order at the counter, after you get your food, team members will seat you at an empty table which sure beats wandering around the restaurant looking for one. 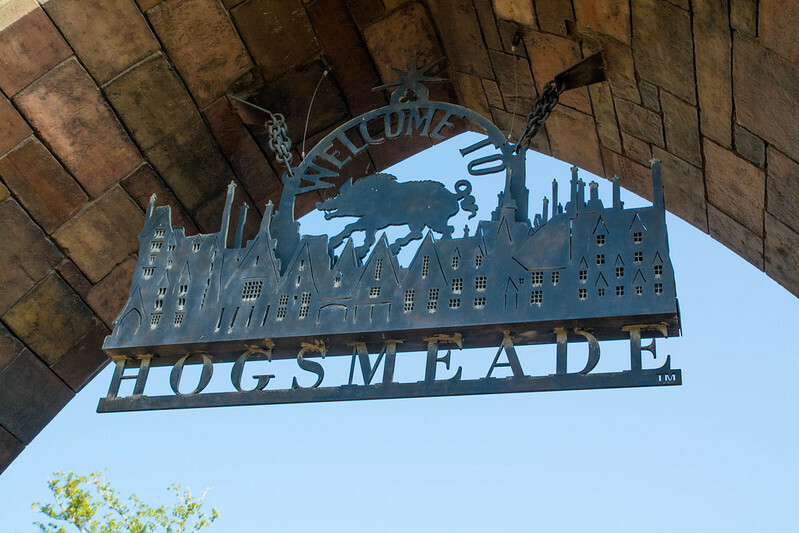 Adjacent to Three Broomsticks is the Hog's Head Pub which has a larger selection of draft beers, as well as a full bar. 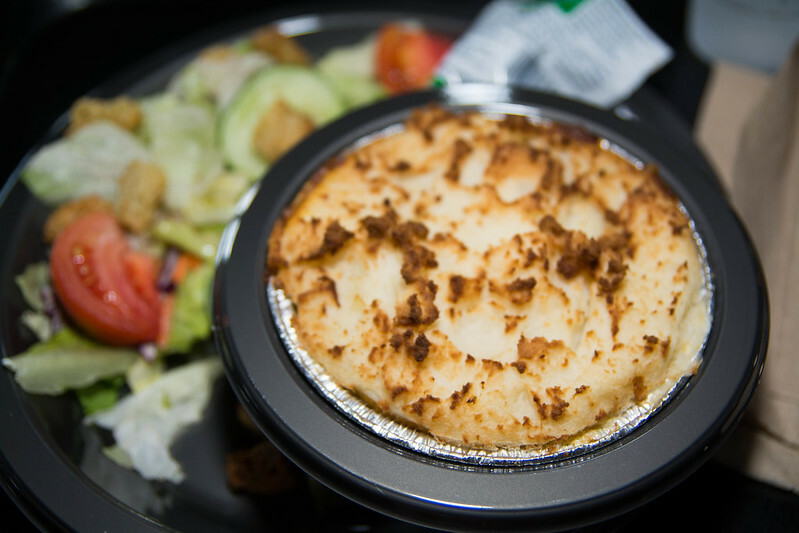 And I ordered the Shepherd's Pie. It was wonderful! 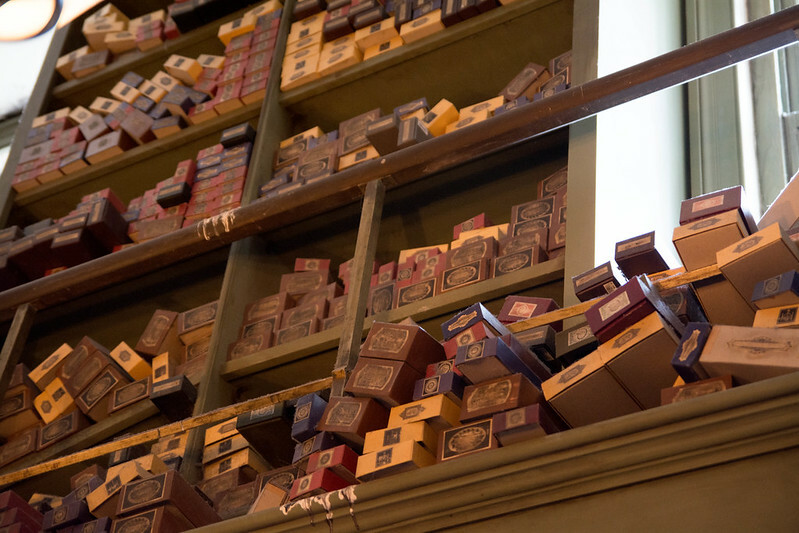 We had noticed the long line at the side of Olivanders, where Harry Potter was fitted for his wand in the Harry Potter and the Sorcerer's Stone, to get fitted for a wand. 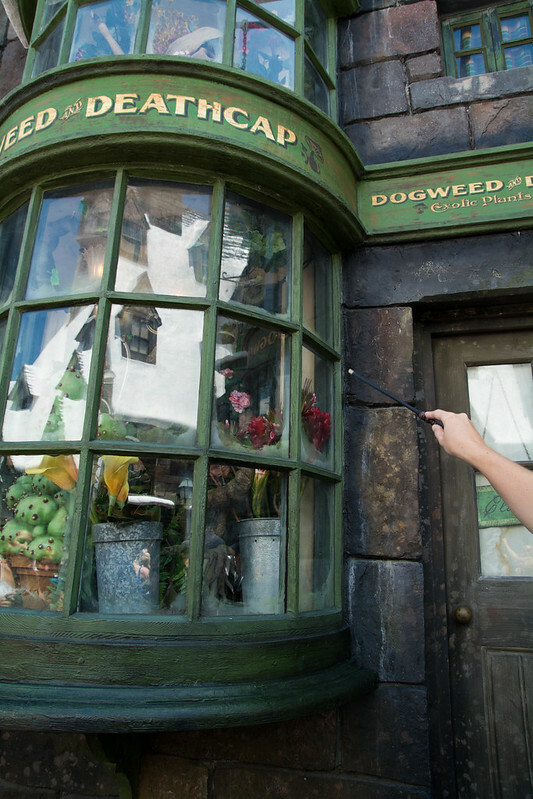 You do not have to get fitted to purchase a wand, though. 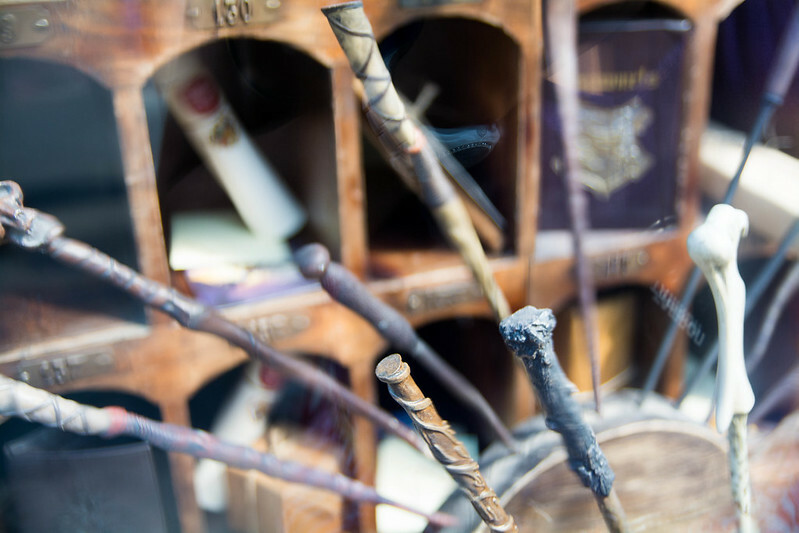 Inside Olivanders, there are many wands to choose from, including character wands - Harry, Hermione, Ron, Dumbledore, and even Voldemort. 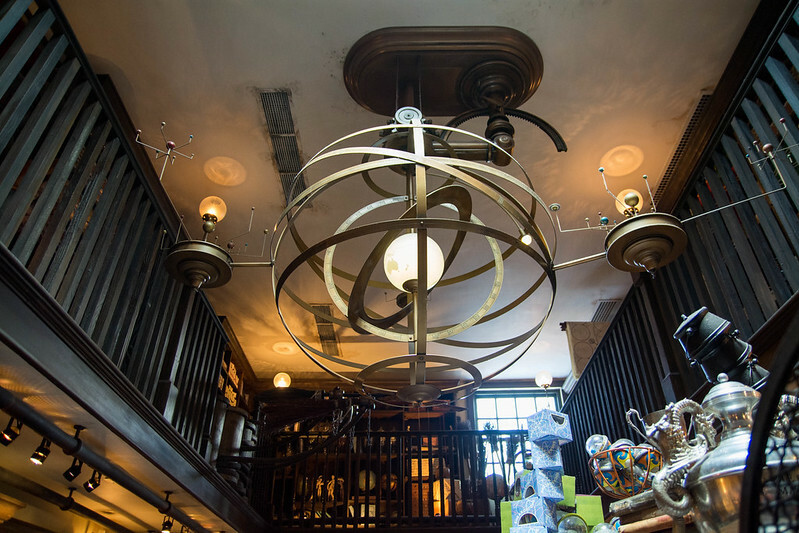 Olivanders is small, built to the same scale as the movie version of the store (another JK Rowling insistence). Therefore, it's a tight squeeze past all of the other theme park-goers. 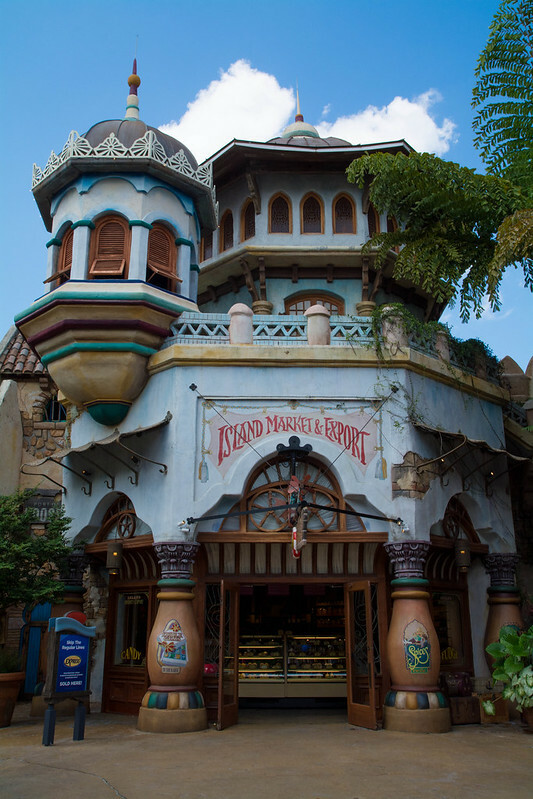 But the shop contains so much detail that it's definitely worth the look. 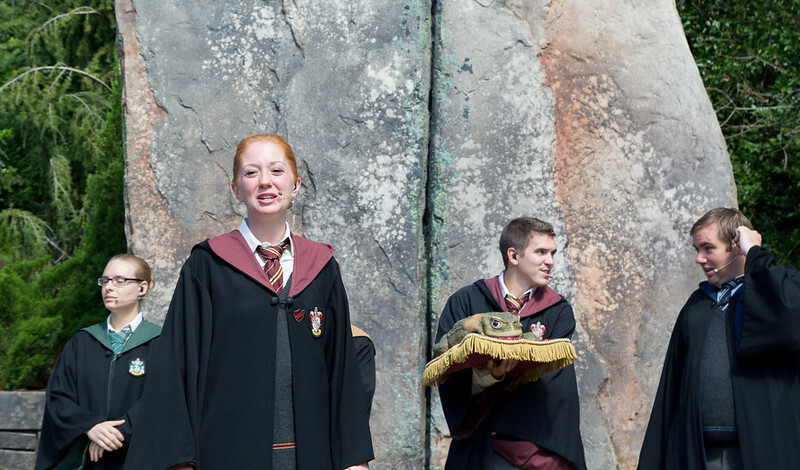 Natalie, the lone Harry Potter fan of the group, didn't come home empty-handed. 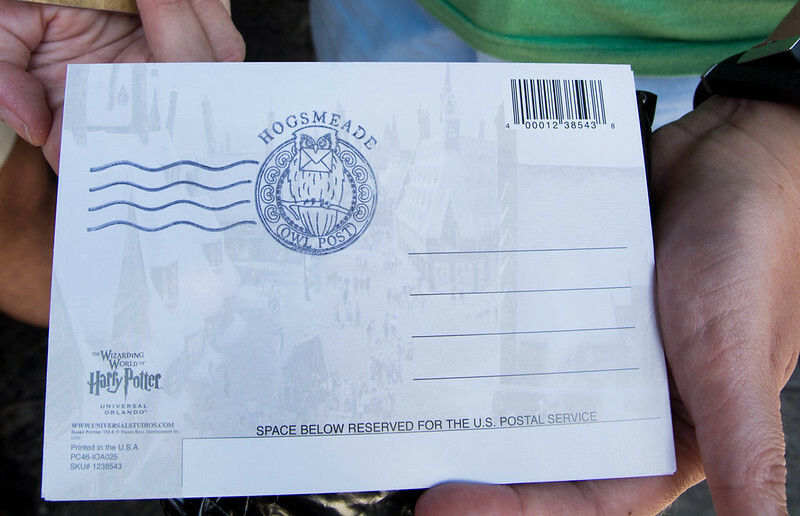 And, she got her postcard stamped from Hogsmeade (Owl Post - how cute!). 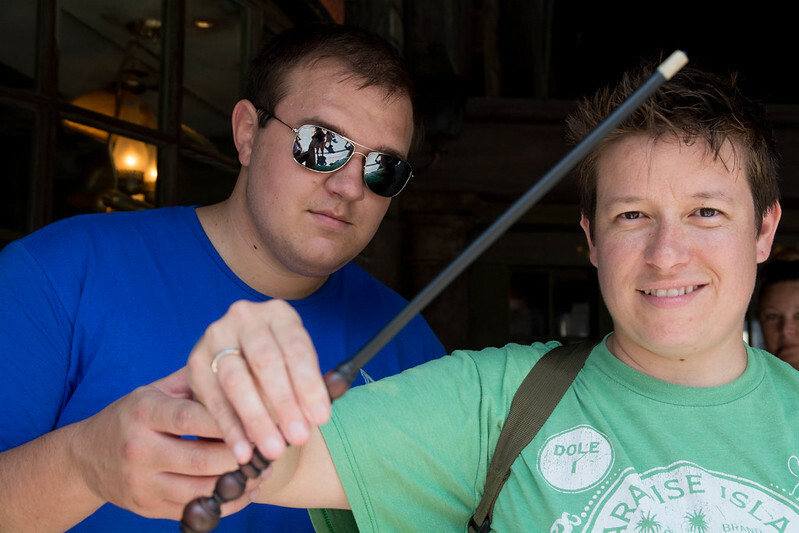 The park includes several interactive areas where you can put your new wand to good use (similar to Agent P's World Showcase Adventure in Epcot and Sorcerers of the Magic Kingdom). 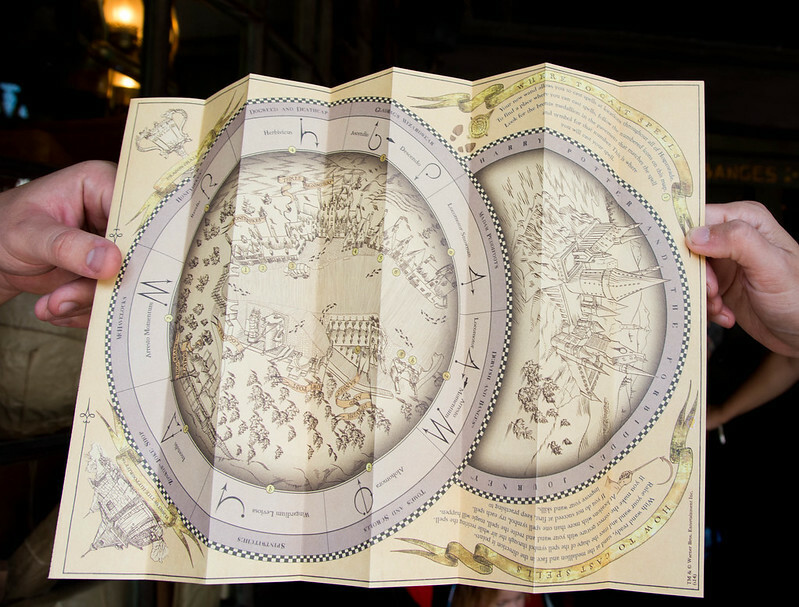 A map included shows where in the Wizarding World you can make some magic, as well as the specific wand motions (if you forget your map or don't feel like pulling it out, you can also see the wand motions in a bronze circle on the ground). 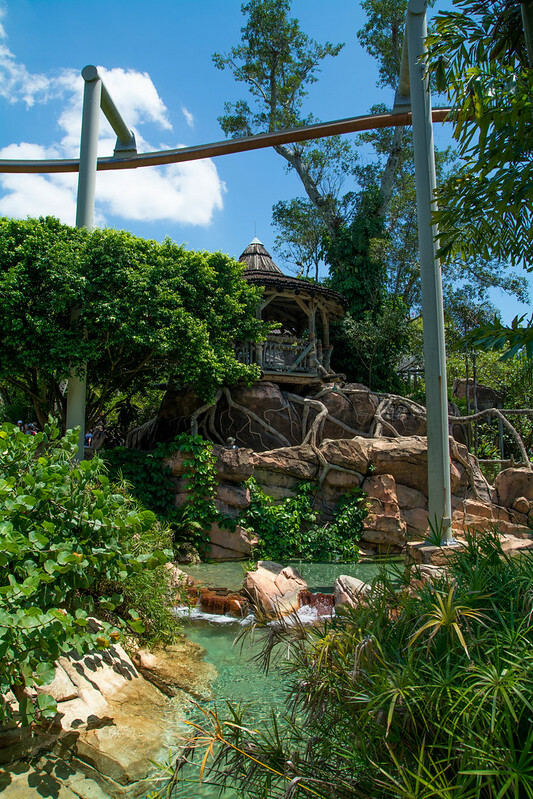 Rather than continuing our circle around the lagoon, we went back to Jurassic Park to do the River Adventure one more time. 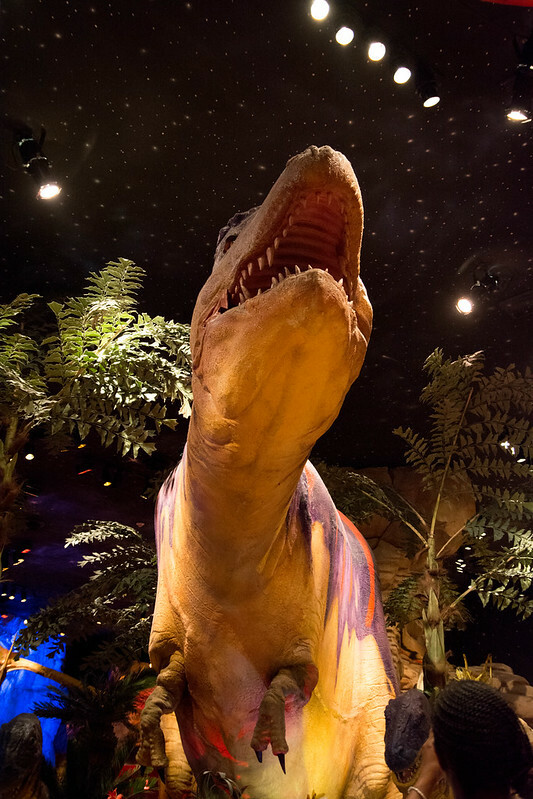 Sure enough, we reached the top with the BIG, SCARY DINOSAUR, and - "Absolutely no photography! Put your cameras away, row 5!" AGAIN!?!?!? Whoever was working the River Adventure must be either power-hungry or extremely bored. But it is not acceptable to ruin my ride experience with these stupid loudspeaker announcements! 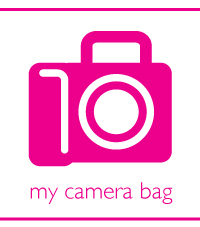 They've probably already taken their photos.... there is nothing you can really do about it. It would be more effective to find them after the ride and give them a personal warning. 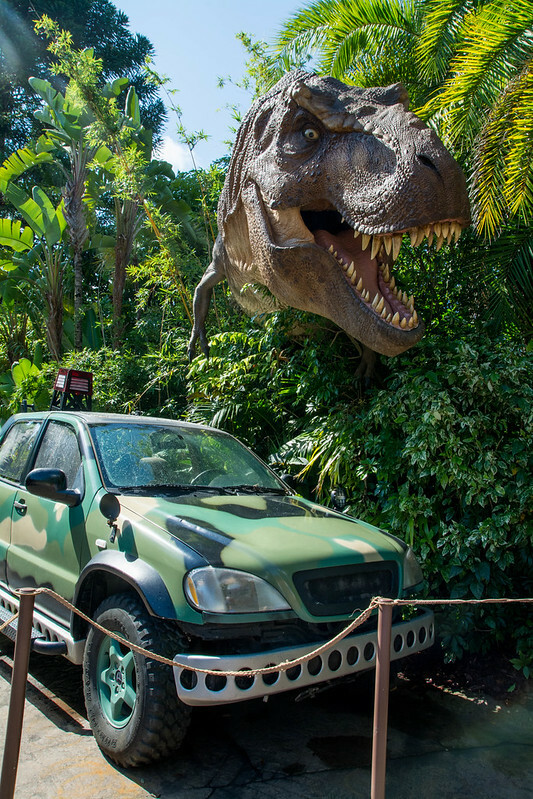 No need to ruin the ride for the rest of us! We also ate churros. Max says that the churros were better at Islands of Adventure. 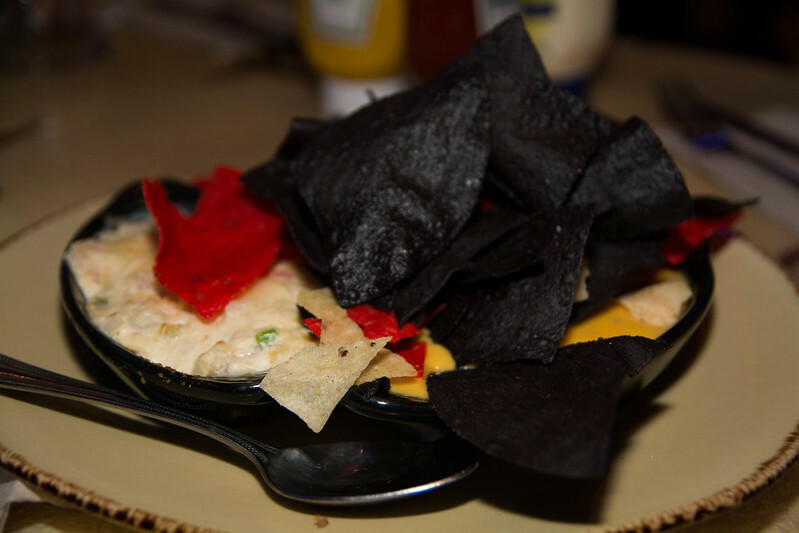 I preferred the churros at Frontierland in Magic Kingdom. 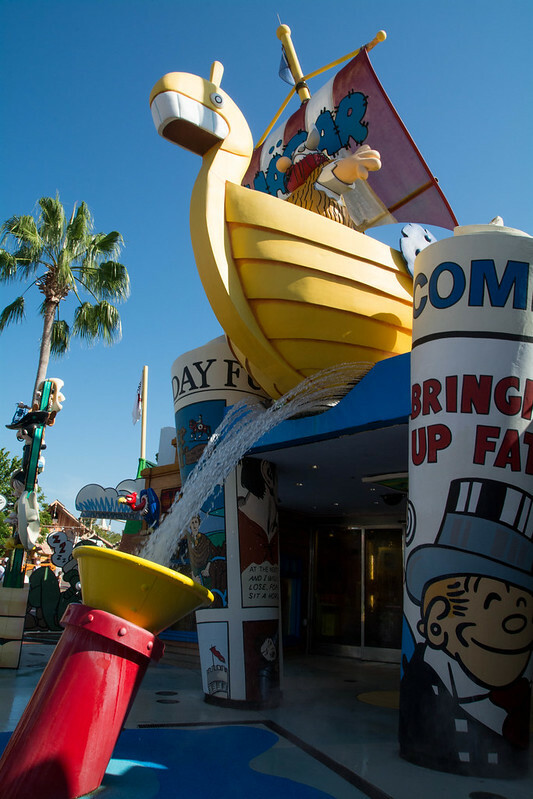 Back through Toon Lagoon.... but not to ride the water rides. 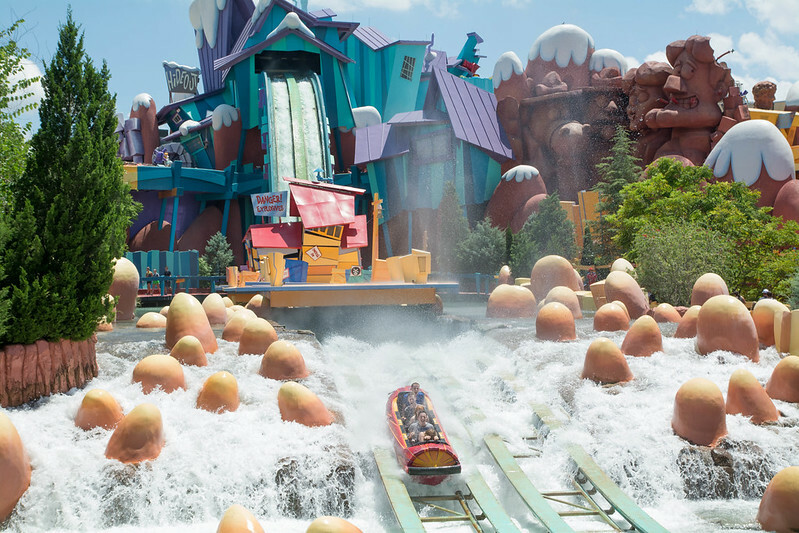 I know I said that log flumes generally don't get you that soaked.... but I remember riding Dudley Do-Right's Ripsaw Falls back in 2007, and the water comes in over the edges and soaks your bottom half. Definitely the most drenching log flume I've ever been on. I really hate wet clothes. Maybe the next time I come back, I'll wear some quick-drying clothing just to do these rides. 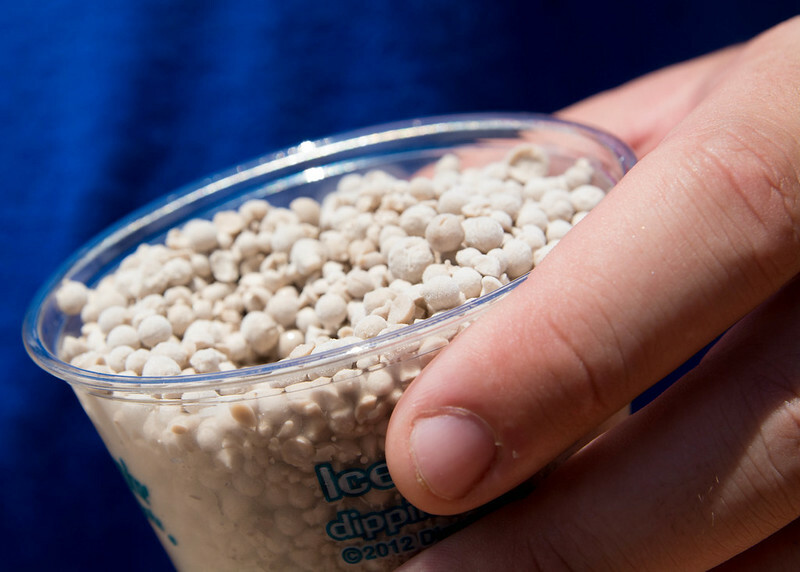 We had to stop for Dippin' Dots, one of Max's favorite theme park treats! 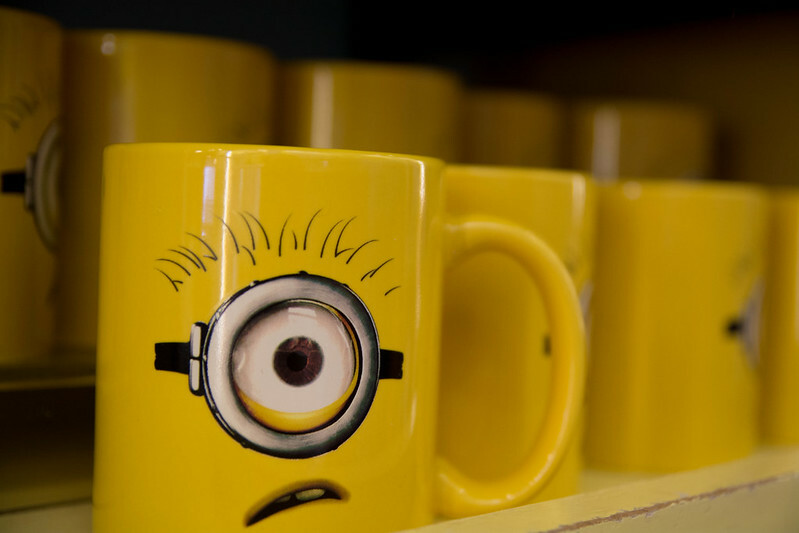 The minion merchandise from Despicable Me is pretty cute. 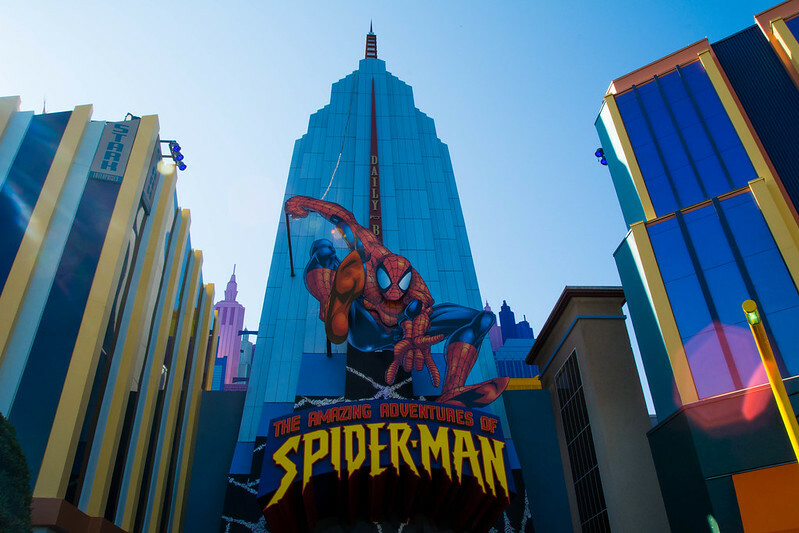 The other attraction we really wanted to ride again was the Amazing Adventures of Spiderman. We were really curious to see how the freefall scene worked, and Max said that he was going to take off his glasses to give it a look. It turned out that he didn't even have to give up his ride experience to check out the technology. Our ride in the Scoop went smoothly until the freefall scene.... and it paused. We were stuck. For a bit, everything stopped. And then the video started to continue, but our ride vehicle wasn't synced. It gave us a few minutes to take our glasses off and look around. After we arrived at the unloading dock, the team members weren't very apologetic about our messed-up ride. "If you want to ride it again, go through the blue door." 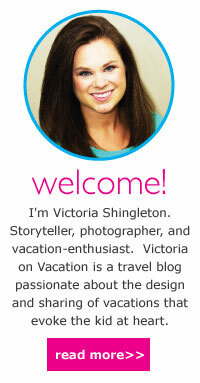 I was expecting something more like, "I'm so sorry that your ride was interrupted to technical difficulties. 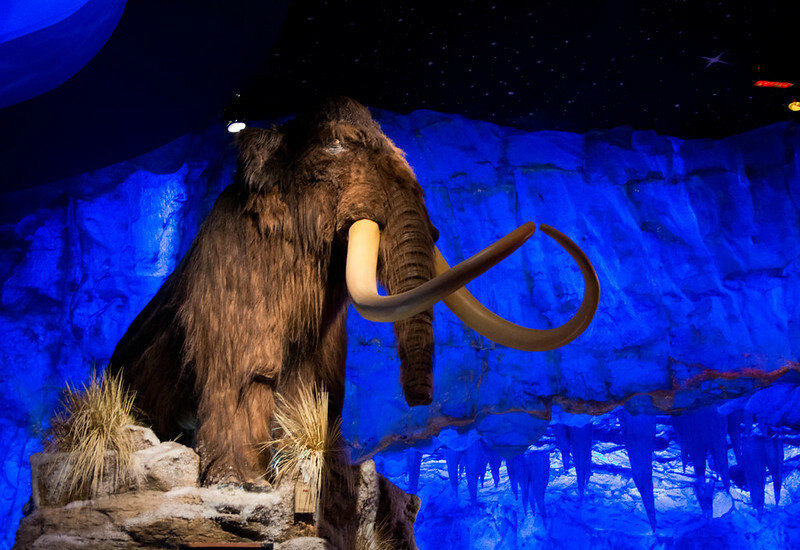 Please experience this attraction again with minimal wait by going through the blue door." Sheesh, they should hire me to train these punk kids they call "team members" how to execute some real customer service. Max and I needed a restroom which turned out to be near the Incredible Hulk. It was only a 10 minute wait! One more time, please??? And with that, we decided to leave Islands of Adventure. Our day was surprisingly very efficient. 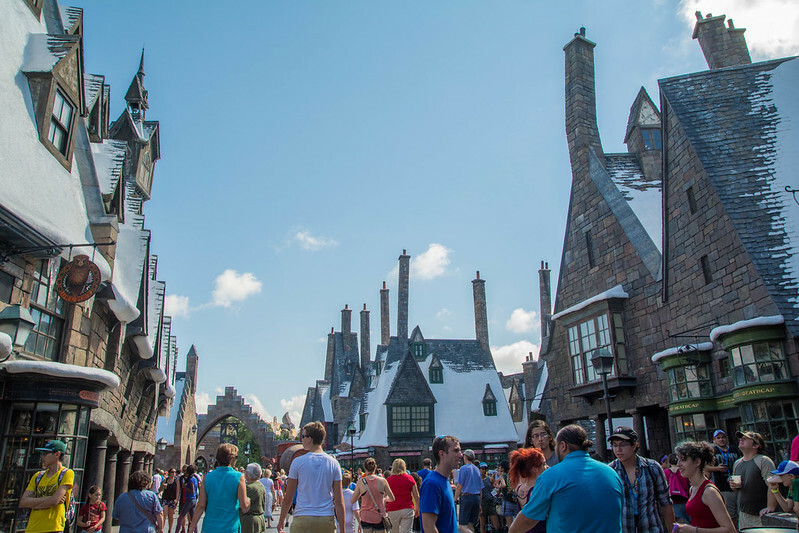 Perhaps we benefited from the recent opening of Diagon Alley in Universal Studios, but Islands of Adventure was not very crowded. The longest we waited was 40 minutes (Harry Potter and the Forbidden Journey and the second time on Amazing Adventures of Spiderman), so I'm very glad that we chose to not purchase an Express Pass in advance. How did I like Islands of Adventure? 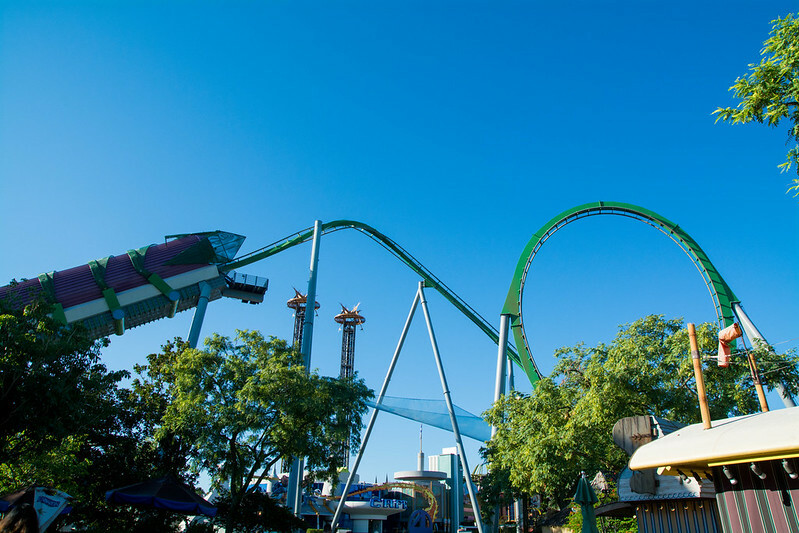 Well, I really enjoyed a lot of the rides - Incredible Hulk, Amazing Adventures of Spiderman, Jurassic Park River Adventure, Harry Potter and the Forbidden Journey, and Dragon Challenge. 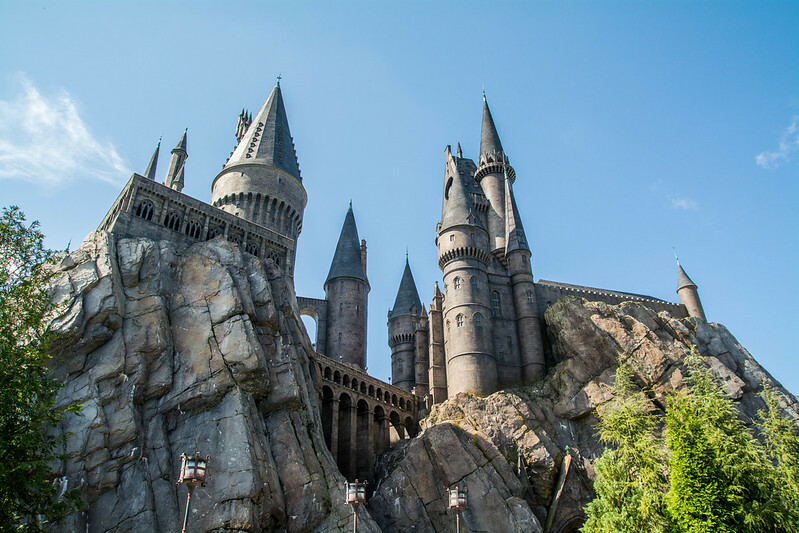 While Islands of Adventure doesn't have as many attractions as, say, Magic Kingdom, it has good rides, and several are on the same caliber and perhaps even exceed Disney in the area of technology and theming (Spiderman and HP Forbidden Journey). 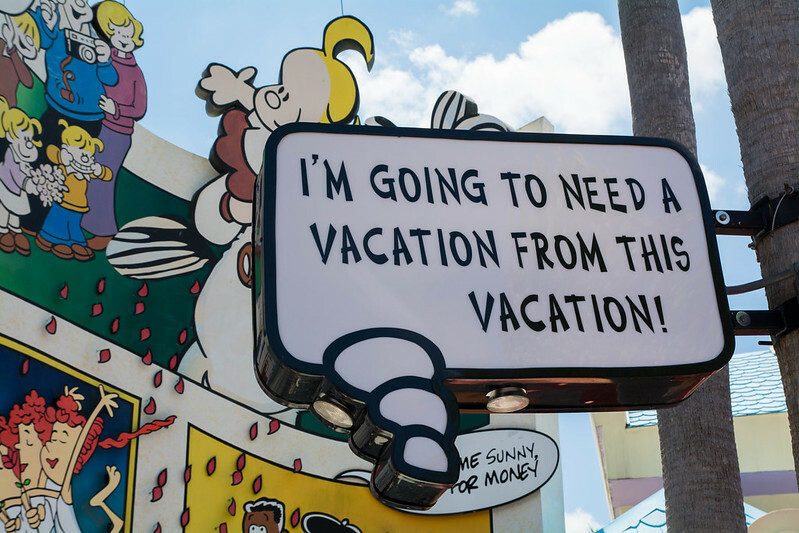 That being said, I didn't go to Islands of Adventure thinking or even hoping that I would hate it. In fact, I remembered really enjoying it when I went in the past. 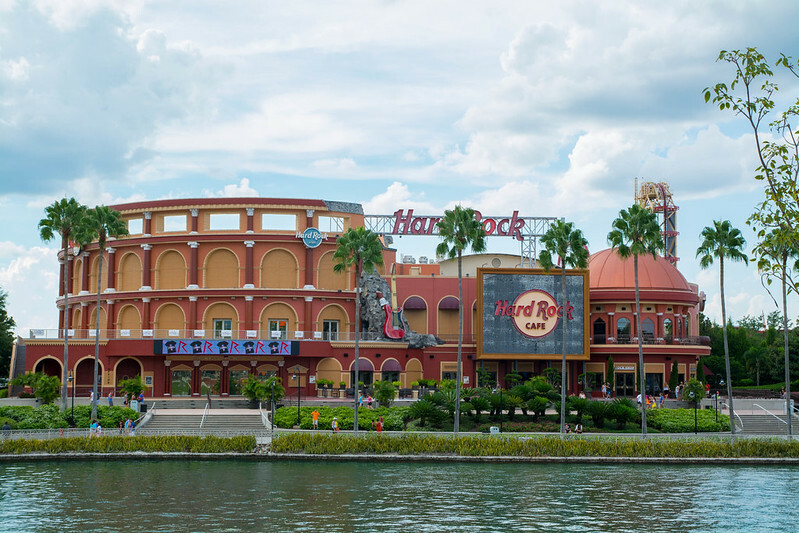 So why do I almost always choose to return to Disney, but not Universal? I've decided that it's just because I connect with Disney's stories so much more. Sure, I enjoyed the Spiderman movies (and when I think Spiderman, I think Toby McGuire Spiderman... though the new Spiderman is a cutie), but I never read the comics. I read and really enjoyed the Harry Potter books when I was a child, but my interest in wizardry ended there.... I haven't even seen all of the movies! 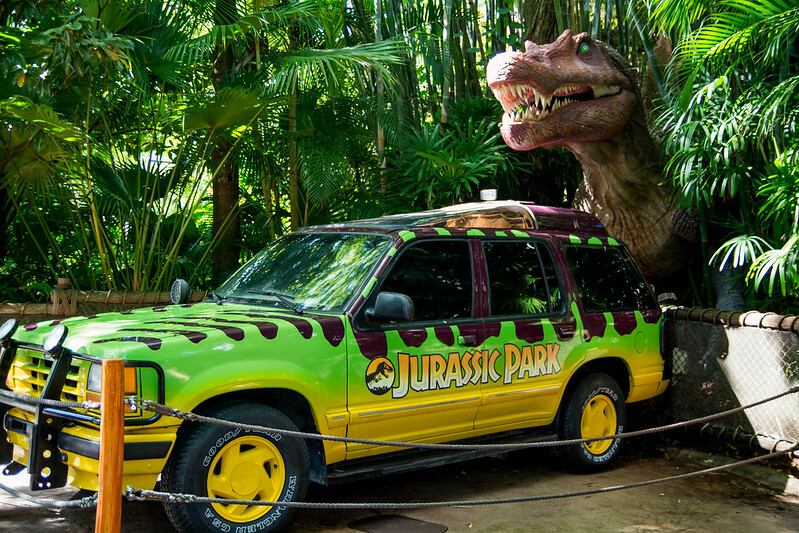 And while I love the soundtrack to Jurassic Park, I've only seen parts of the first two movies. 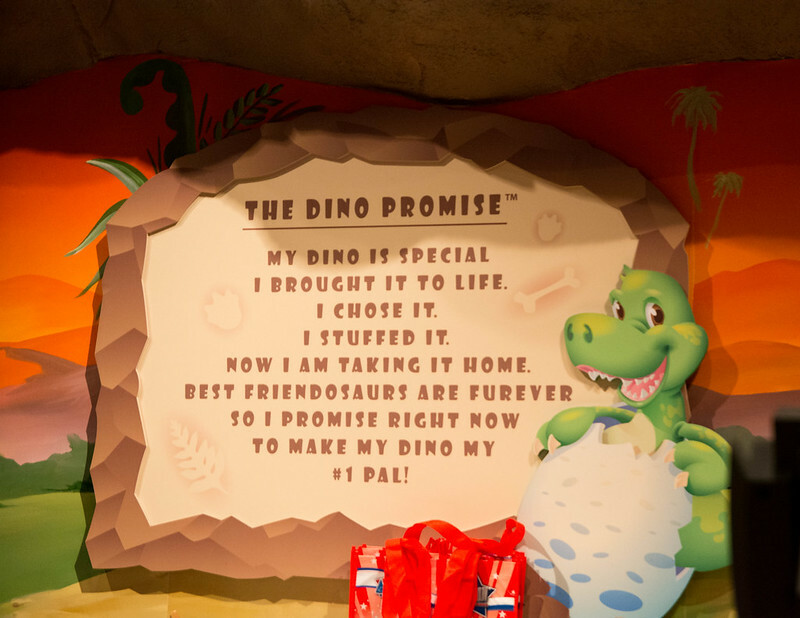 So as great as the storytelling is within the attractions at Islands of Adventure, it just doesn't tug at my heart like Disney does. 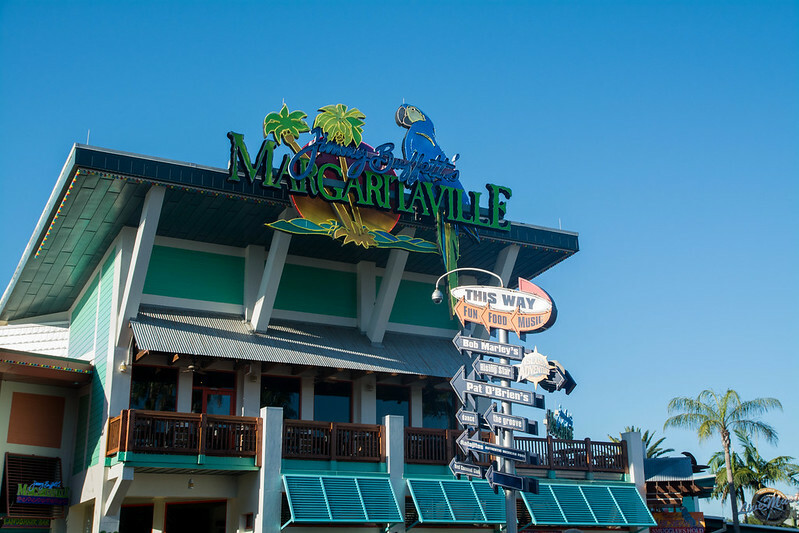 Max wanted to stop at Margaritaville to find a t-shirt. It's a big store with good selection. Max took matters into his own hands and removed the empty glasses from the table and took them to the bar. Immediately after sitting down, we had a bartender! Amazing that no one was willing to bus the tables, but as soon as we sat down, we had service. 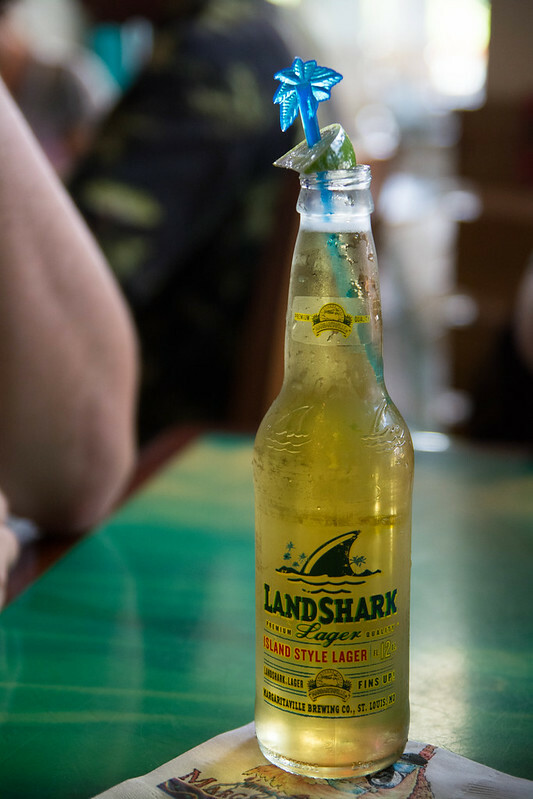 Max had a Loaded Landshark which is a Landshark with a shot of tequila. 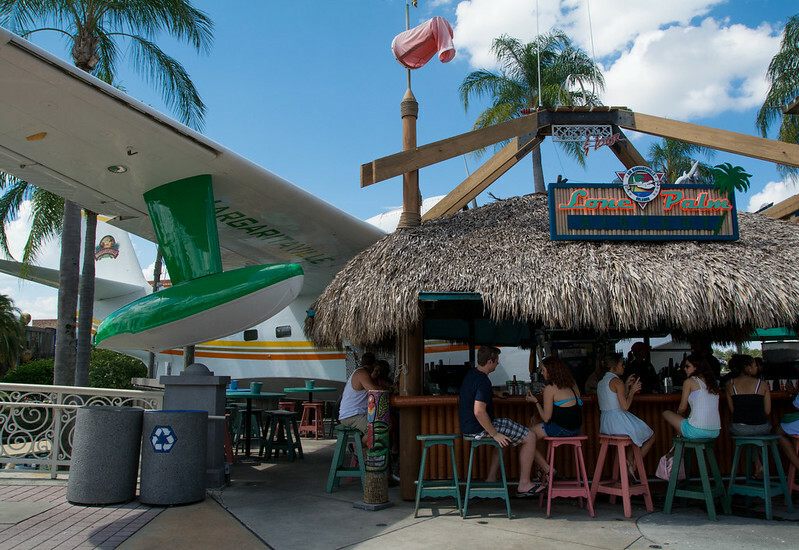 Rachel asked about a Coronarita, but we were told that they don't serve those at this Margaritaville location because Universal has a one drink per person rule (as opposed to Disney which has a one drink per hand rule which is only really enforced during the Food & Wine Festival). 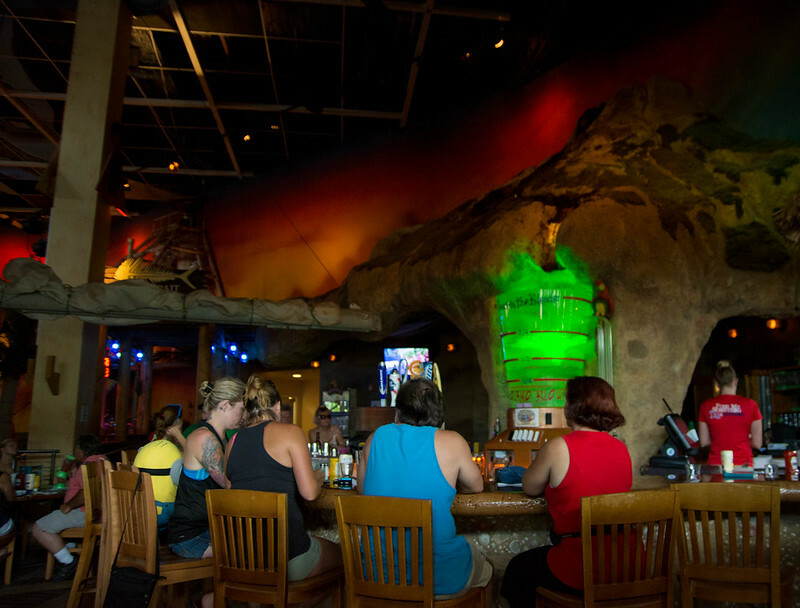 Watch the giant blender behind the bar. When it drains completely, Volcano plays, and the volcano blows, filling the blender at the end of the song. 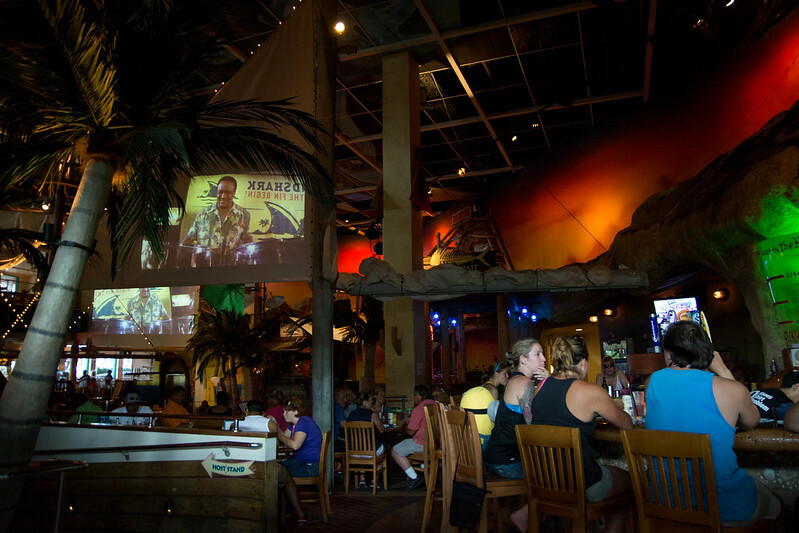 I must admit that this is much more exciting at Margaritaville Las Vegas where a bikini-clad girl will slide down the volcano into the blender. 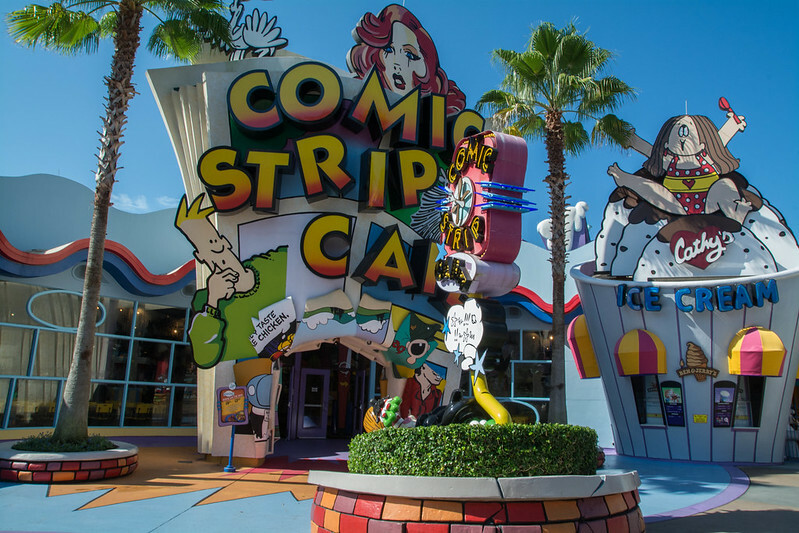 Universal's City Walk has a lot of great names and restaurants, and definitely a location I would like to check out again in the future. 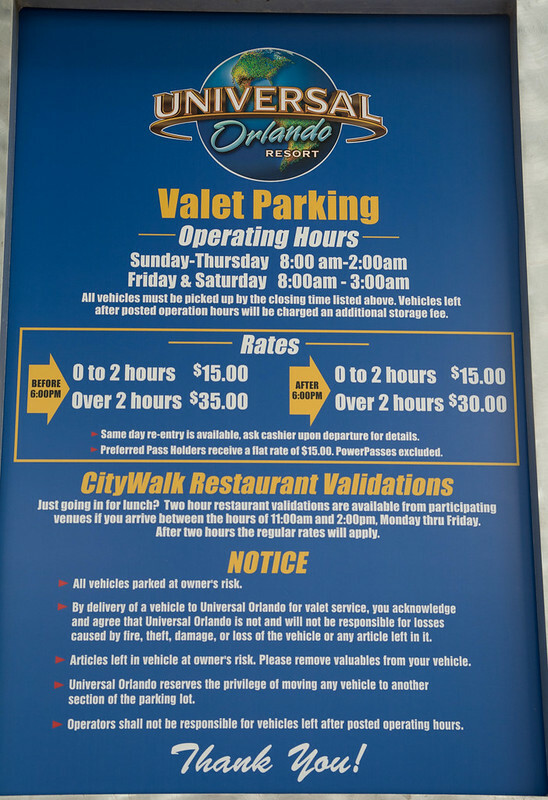 When paying for the valet, Natalie mentioned to the attendant that she had been told that it would be a flat rate of $15.00. To our surprise, the cashier honored our quoted rate. 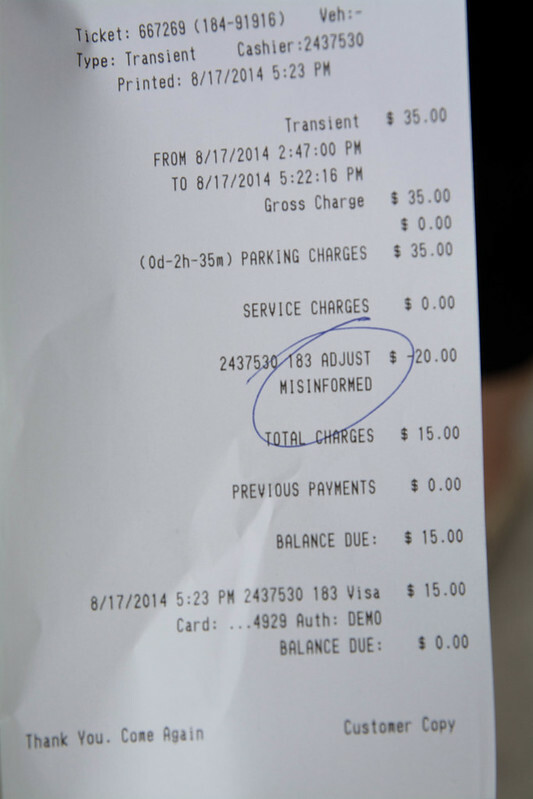 Notice our "misinformed" $20.00 discount! After leaving Universal, we stopped by Premier Outlets so that Max could hit up the Nike store and purchase some tennis shoes. He had been wearing his Sperrys to the park because it turned out that he had outgrown his tennis shoes. Luckily, Max found an awesome pair of blue tennis shoes! 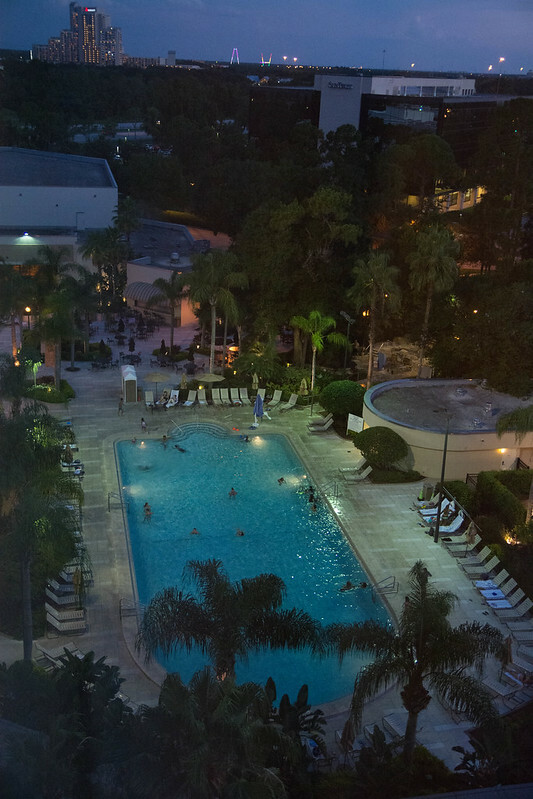 I was glad that we returned to the Hilton Downtown Disney early enough so that I could still get a photo of our view. 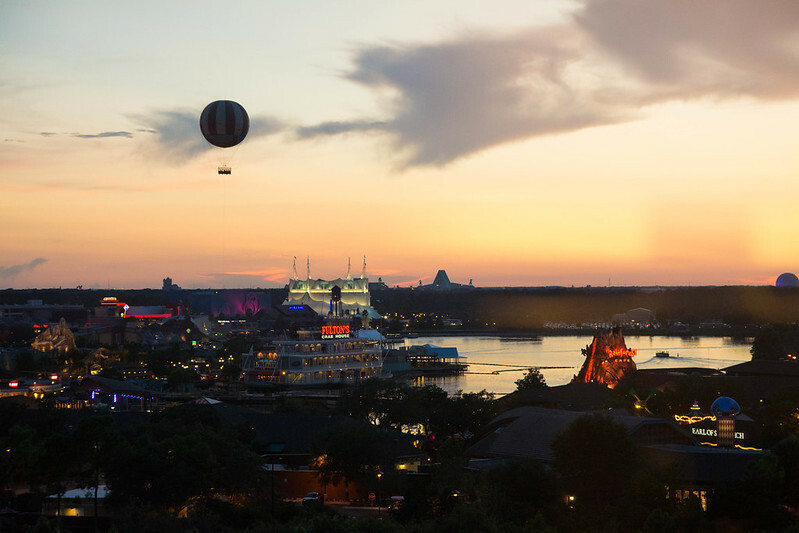 Max and I were on the ninth floor in the business wing and had a great view of Walt Disney World from our window. 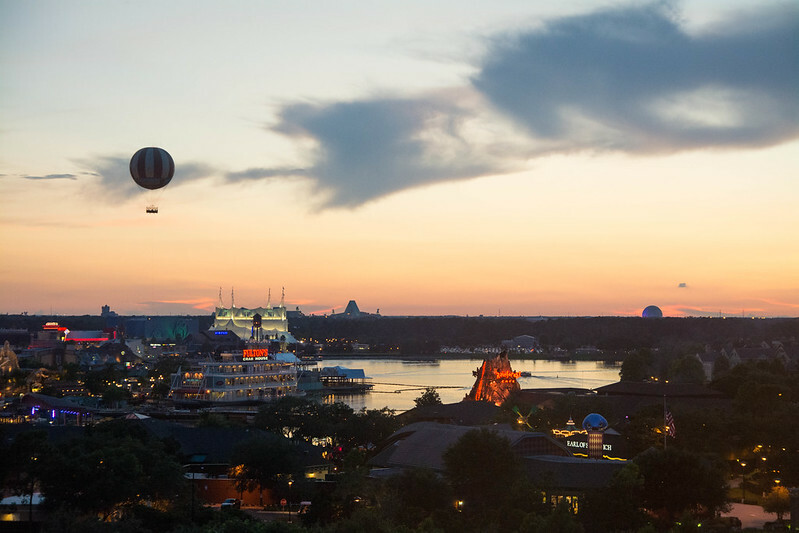 We could see not only Downtown Disney, but the Tower of Terror, Swan and Dolphin, and Spaceship Earth! We also overlooked the pool. Despite the incredible heat during our stay, the pool was an amenity that we never utilized. Believe it or not, after leaving Islands of Adventure, Max wanted to add a little Disney to his day (or maybe he just knows what to say to make me love him even more)! 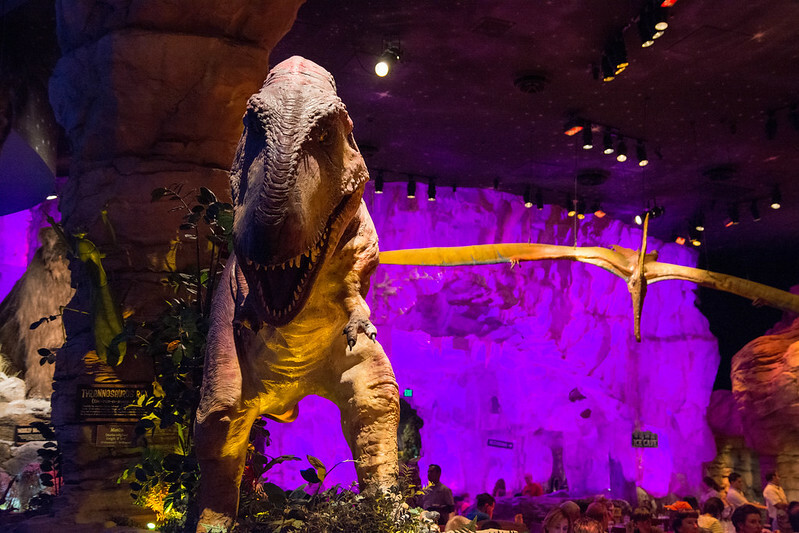 I suggested that we eat dinner in Downtown Disney, and Max and I had both enjoyed T-Rex Cafe in the past. Unfortunately, I was unable to get a reservation when calling (this has never happened before, and when he told me there was no reservation availability, I really wanted to ask him if he was sure), so we had to put our name in and wait an hour. By the time we were seated, it was very late. While we were waiting for our names to be called, Rachel decided to pass the time by building a dino. She got it stuffed and added it's heart (which she upgraded to a beating heart) when we were called to dinner. 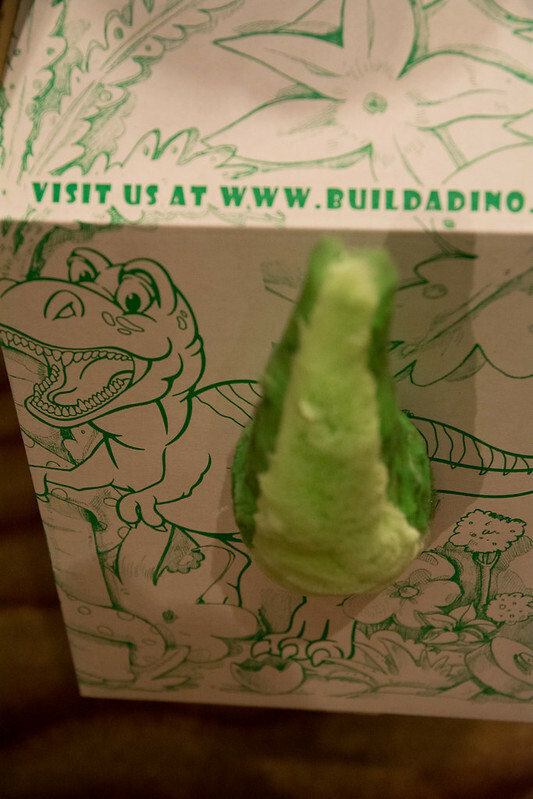 While she was building a dino, I had to stand outside to make sure that I could hear our name being called. There was a guy and a girl calling names. Whenever the girl made announcements, they were extremely loud and clear. Whenever the guy made announcements, they were not only a mumbly mess, but not nearly as audible. I was getting really annoyed with the guy's name calling and was worried that we were going to miss our name. But outside, I did find the boneyard playground where kids can dig up fossils and play with little tiny pebbles which will surely get stuck in your sandals and annoy you with each step until you finally take off your shoe to remove them. 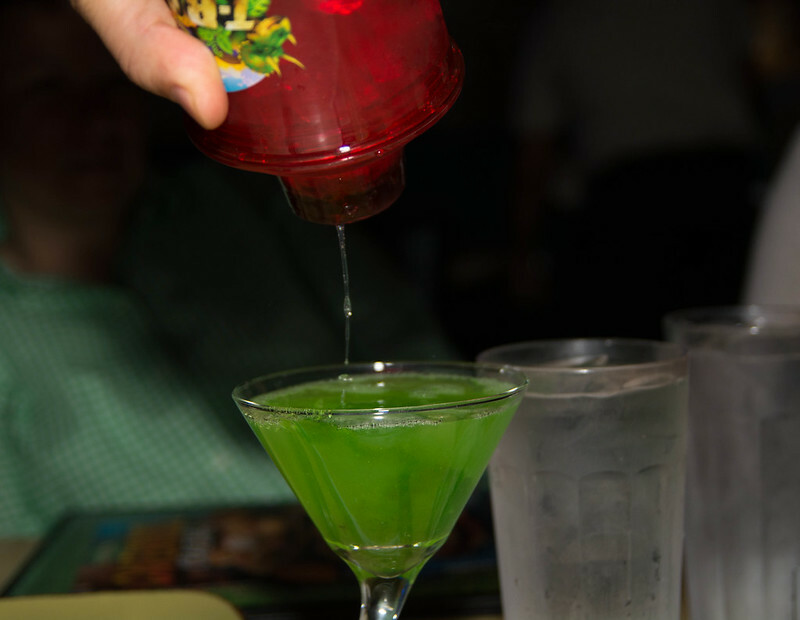 I was really excited to order the Candy Apple Cotton-Tini. 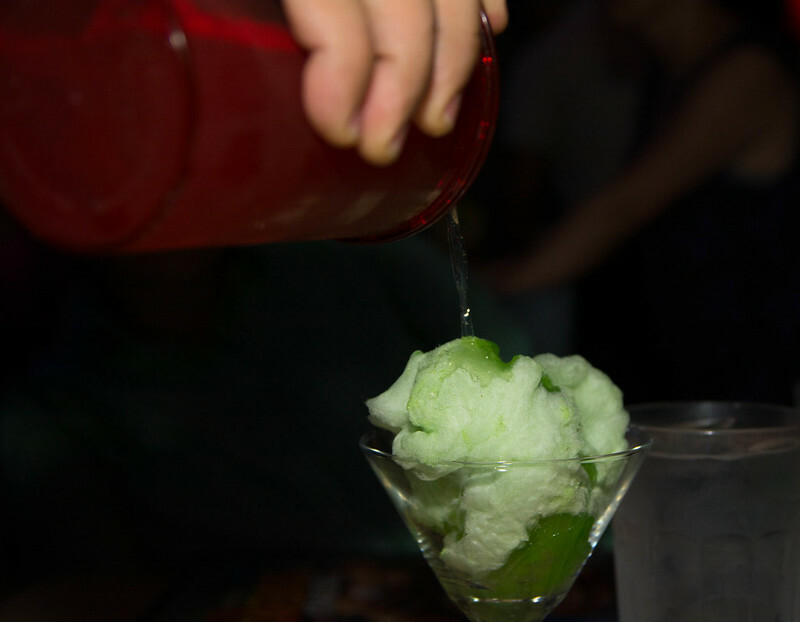 The martini glass came filled with cotton candy, and the martini was poured on top of it, melting the cotton candy. I was really mad at our waiter because he just started pouring my martini without allowing me to get a photo of the cotton candy in the glass! And he was pouring it with the shaker towards me, so by the time he finally got his hands out of the way, the cotton candy had melted! 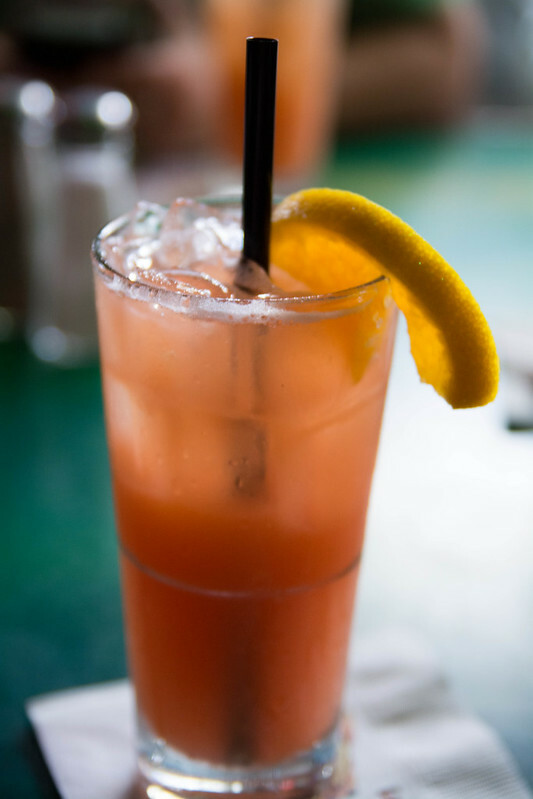 I tried to convince Max to order one so that I could photograph his pre-melt, but he wouldn't do it. 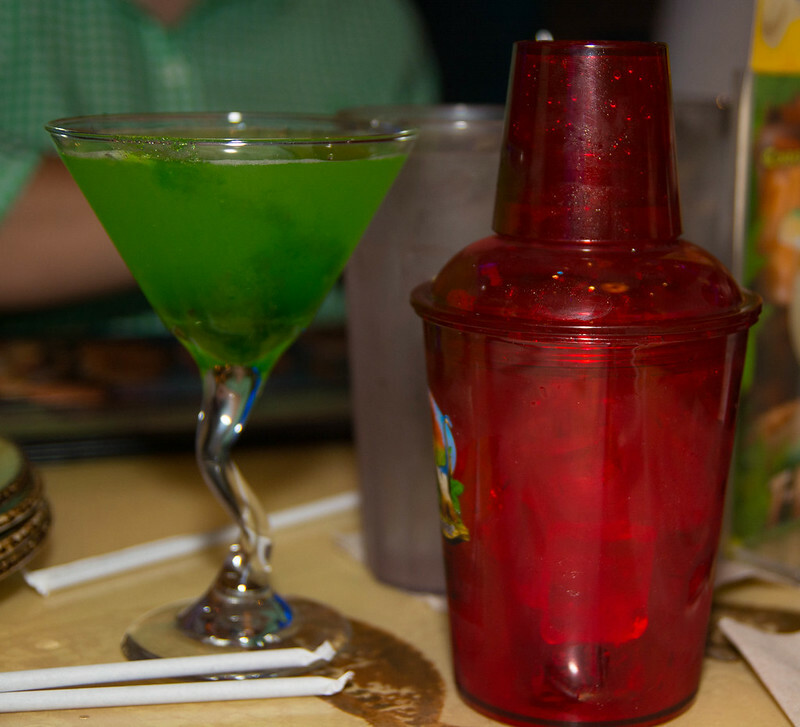 It did come with a souvenir martini shaker. 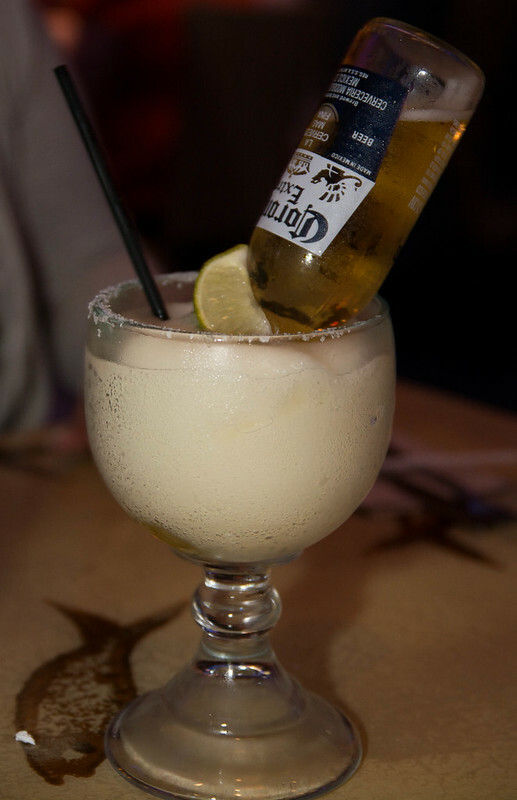 And Rachel finally got her Coronarita! 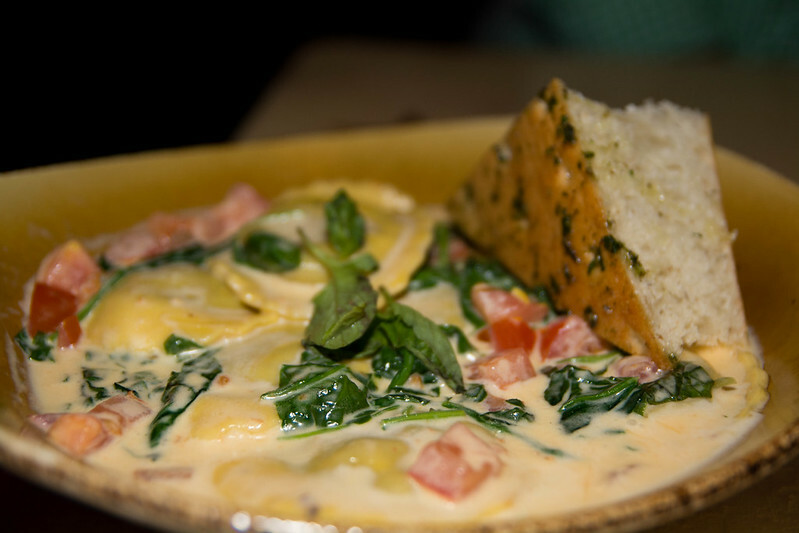 Natalie ordered the Mammoth Mushroom Ravioli. 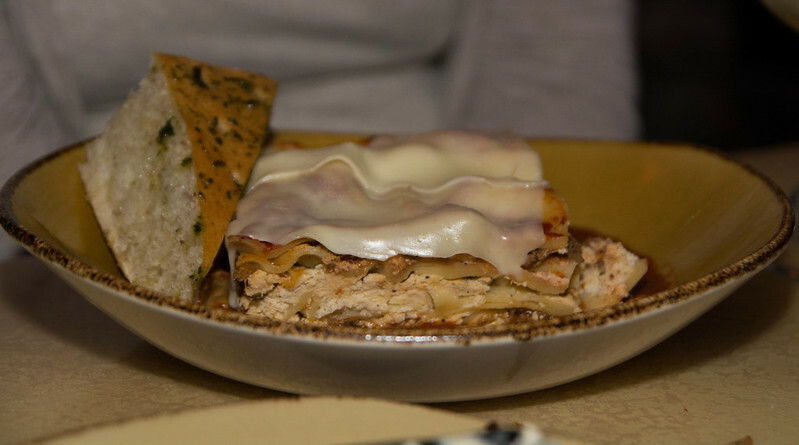 Rachel had the Layers of Earth Lasagna. 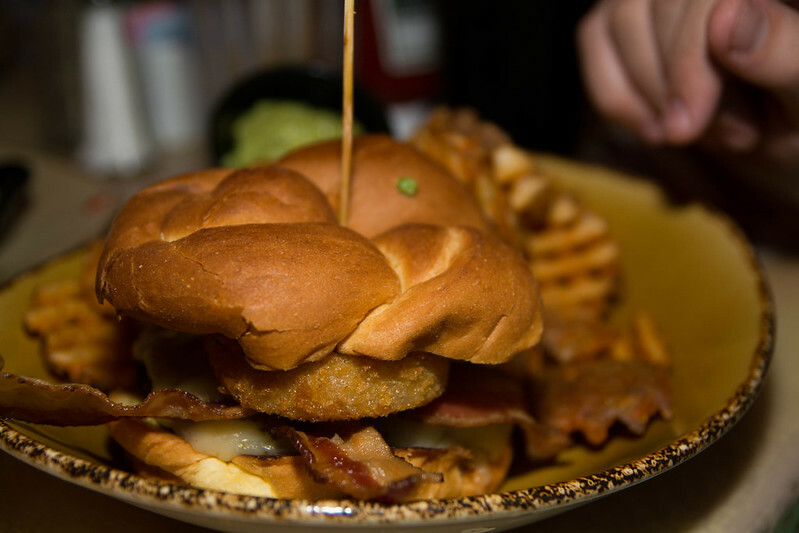 Max ordered the Guac-Asaurus Burger.... with the guacamole on the side! 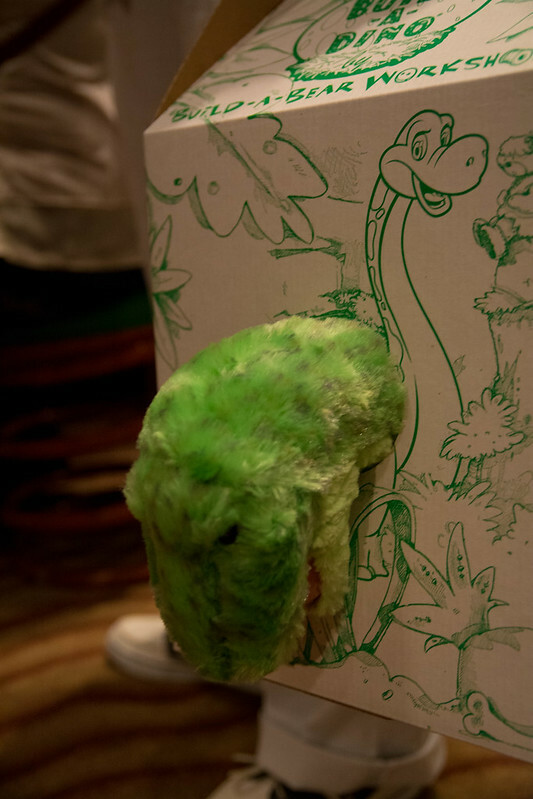 Rachel finished dressing her dino, Toby, after dinner. I didn't photograph him in his cute little sweatshirt and boots, which is a shame. But here he is face-down in the box!